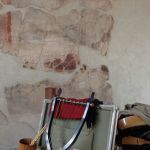 Members of the EMAP project team will share the results of their researches involving music archaeology, science, technology and craftmanship: this allowed to develop a wider knowledge about the music instruments of Europe and how they spreaded from the Mediterranean to the north of Europe, from 40.000 year ago up to the great classical civilizations. 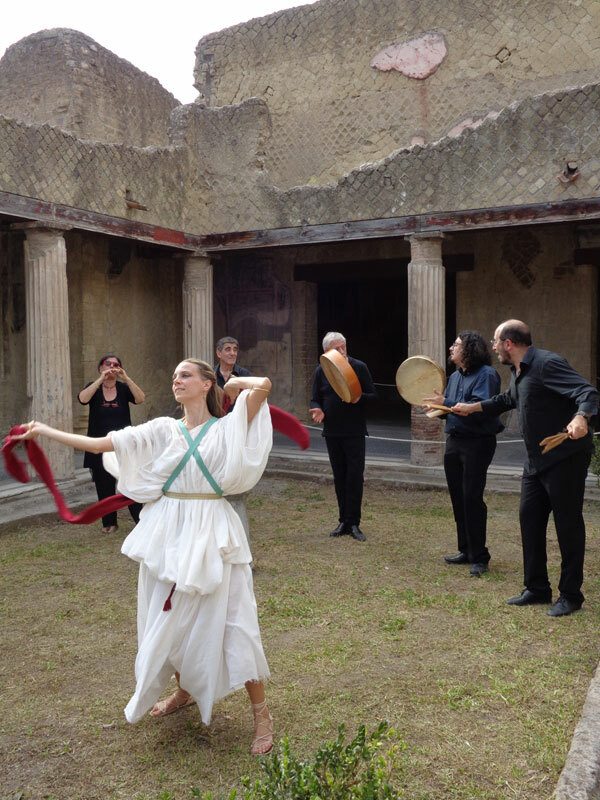 This project focused on an important aspect of ancient cultures that has been neglected both by archaeology and by musicology. 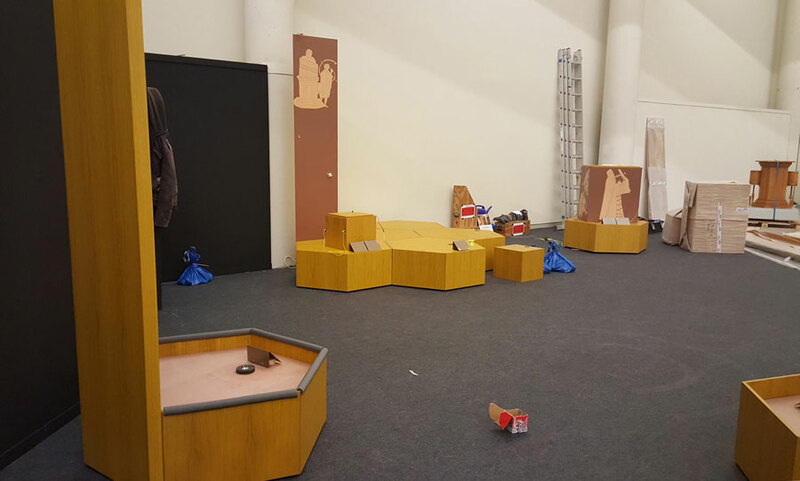 EMAP has come to the end after a long period full of hard work and dedication. 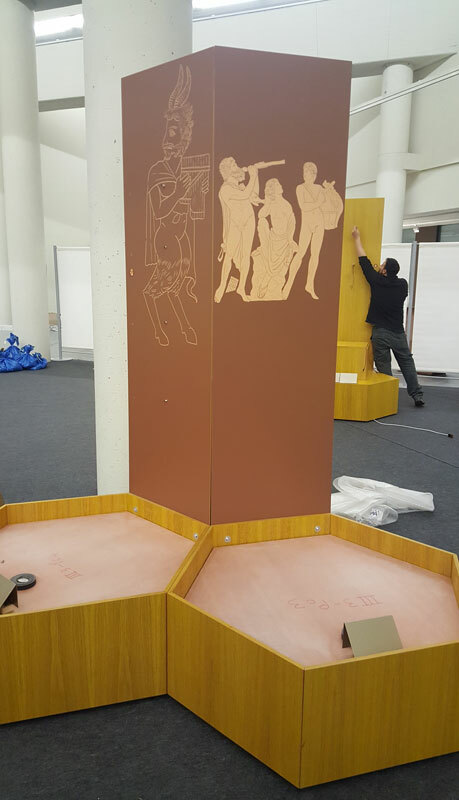 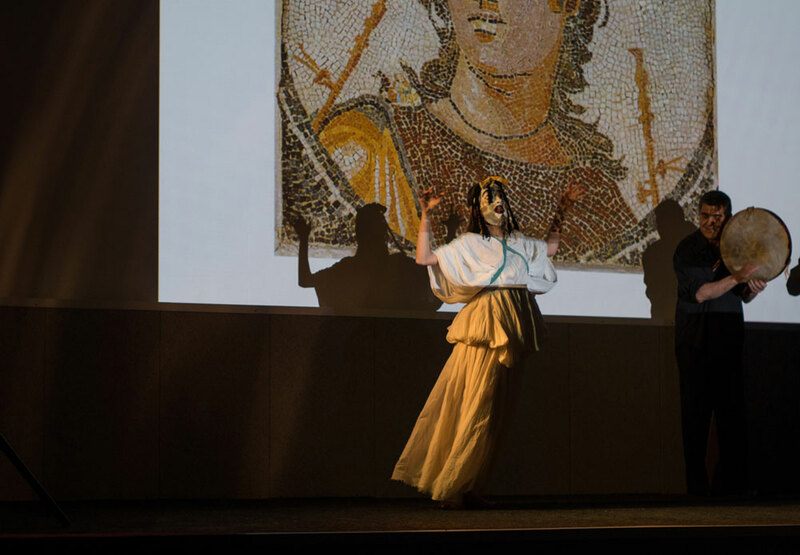 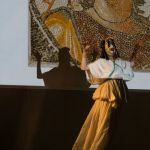 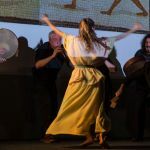 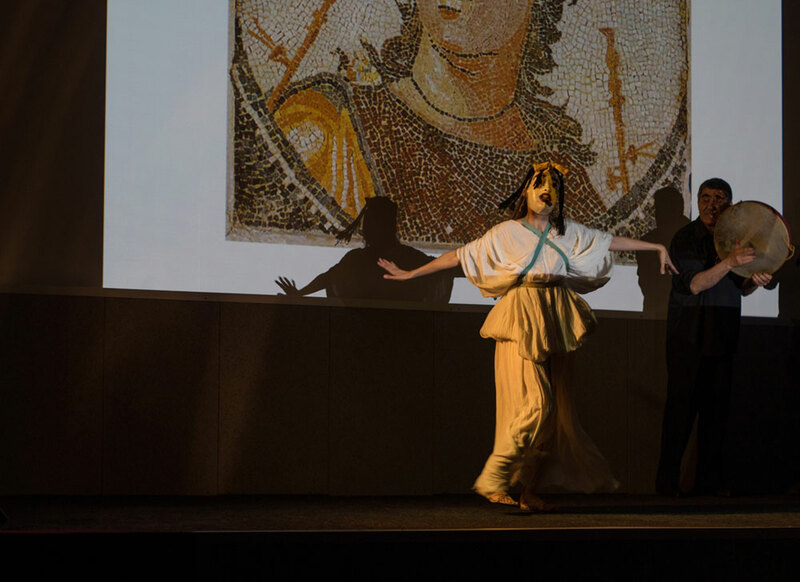 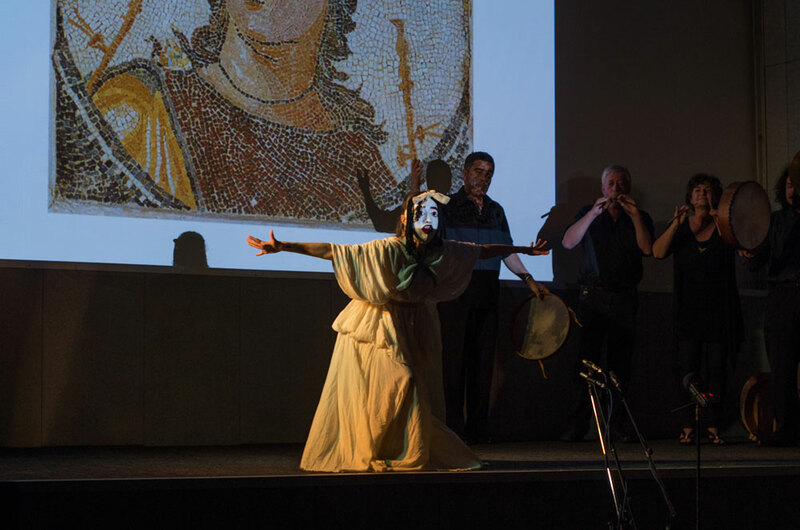 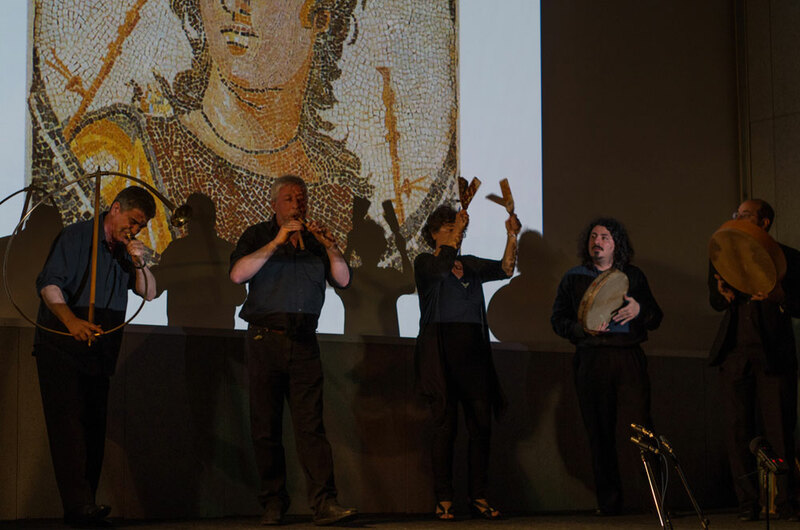 Along with Orpheus – who is represented playing his lyre in Pafos’ mosaics – and with a presentation of the project’s results, EMAP’s epilogue will be celebrated in Cyprus with a concert, organised by the Cyprus Institute in collaboration with the Municipality of Tarquinia. 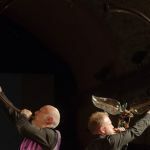 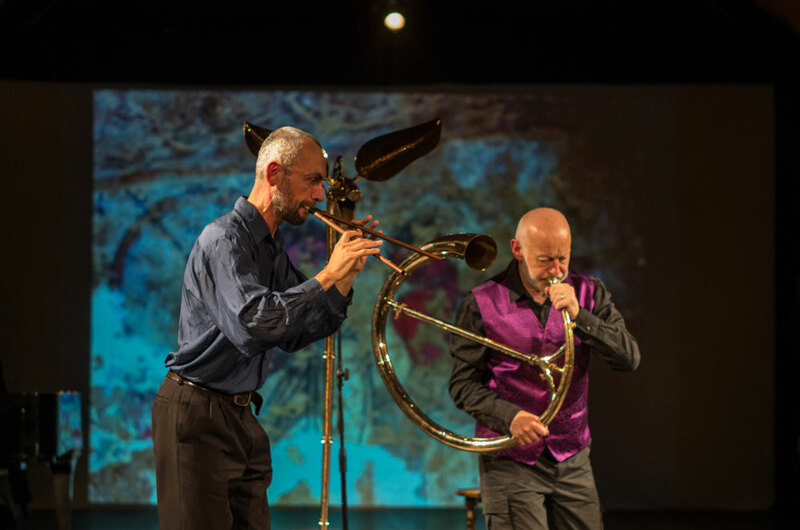 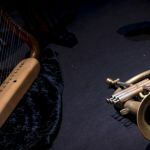 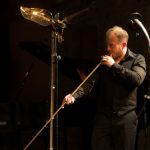 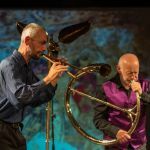 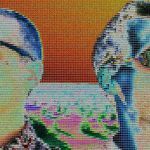 Two distinguished musicians, Stef Conner and Barnaby Brown, investigate the world’s oldest instruments and notation with breath-taking results. 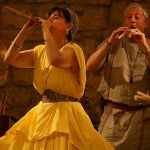 Their musicianship brings Deep History, Mesopotamia, ancient Greece, Anglo Saxon England and medieval Scotland to life. 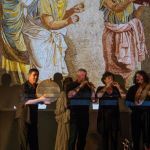 Highlights include a vulture radius bone 40,000 years old and a hymn to Apollo from Delphi, 127 BC – the oldest, lengthiest and best preserved notation of a Greek song. 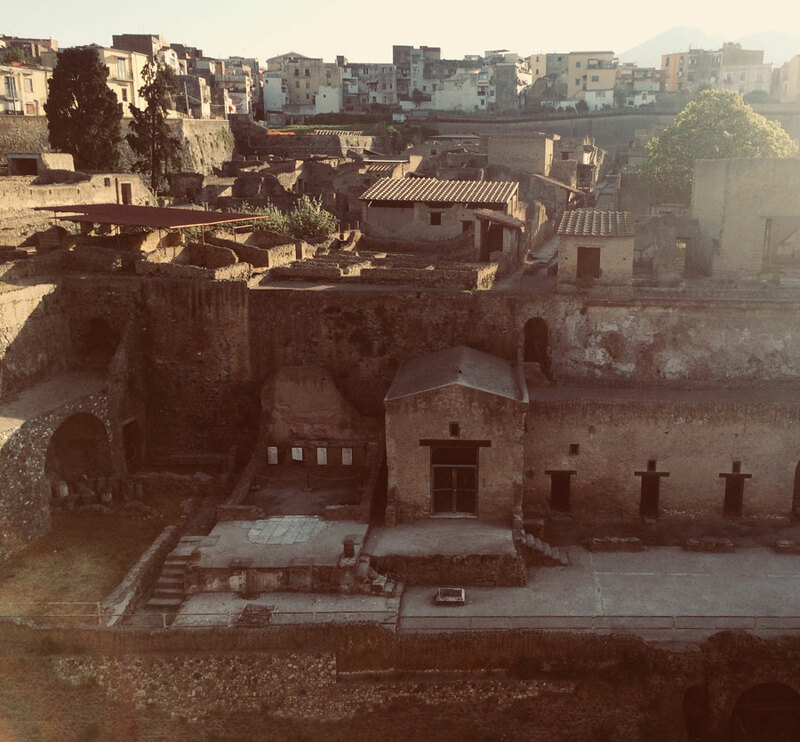 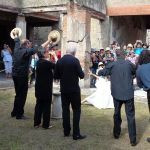 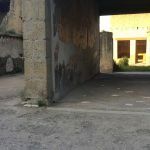 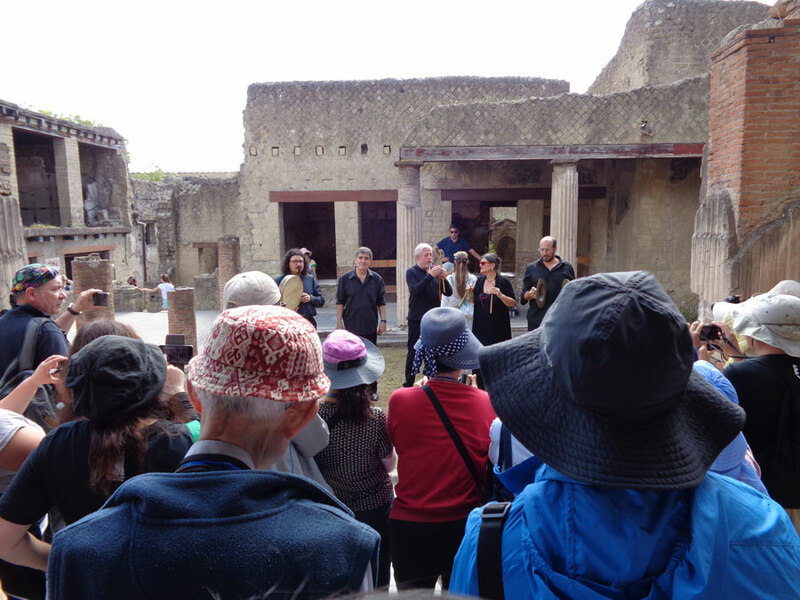 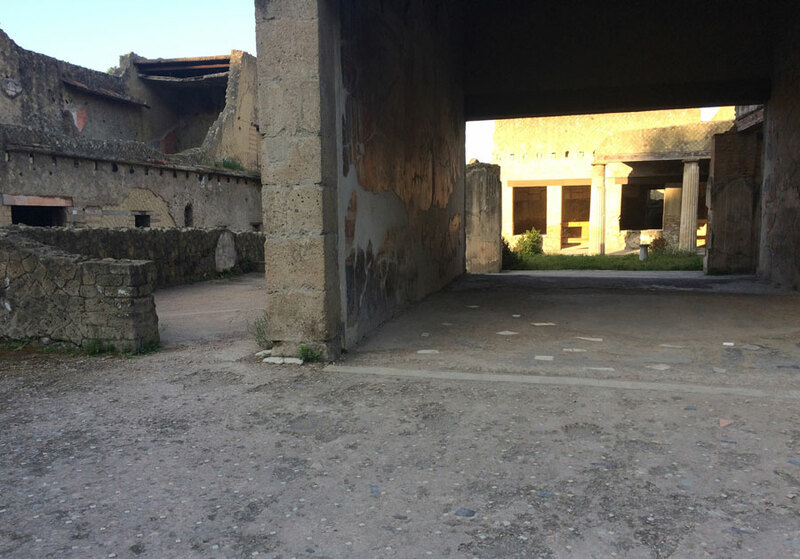 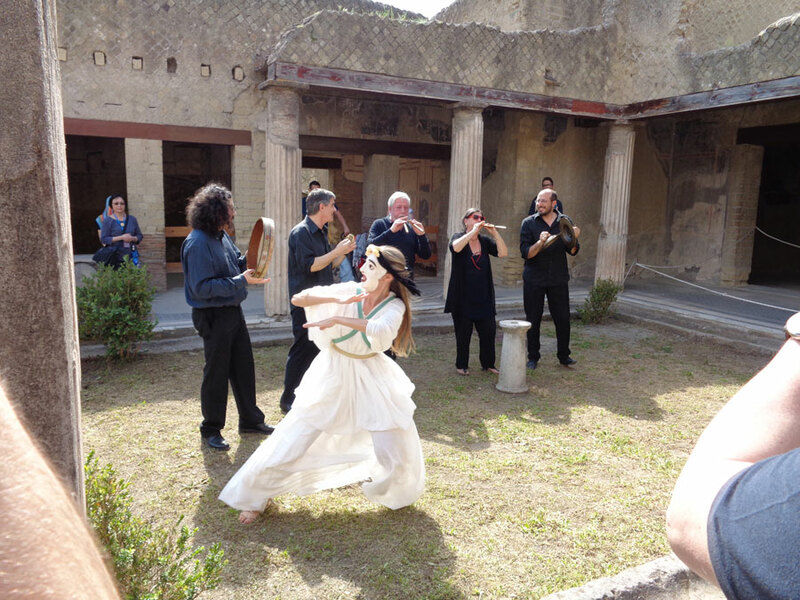 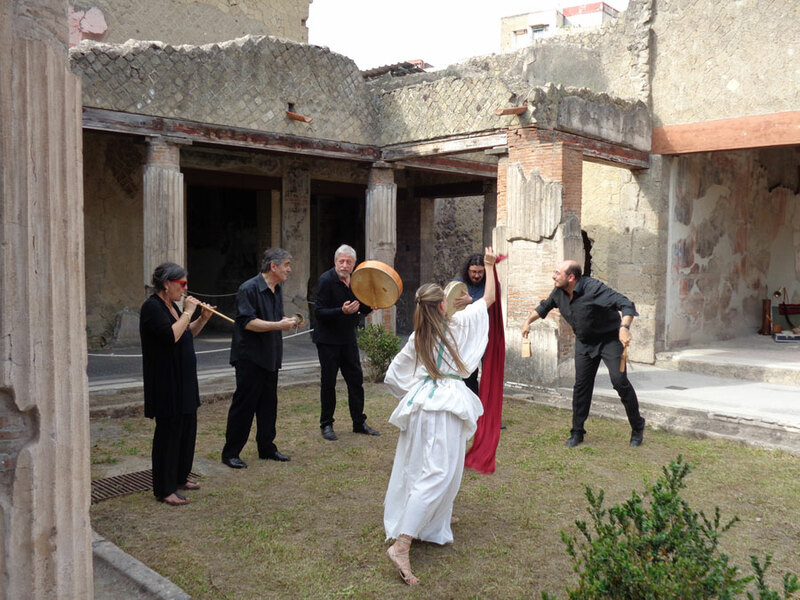 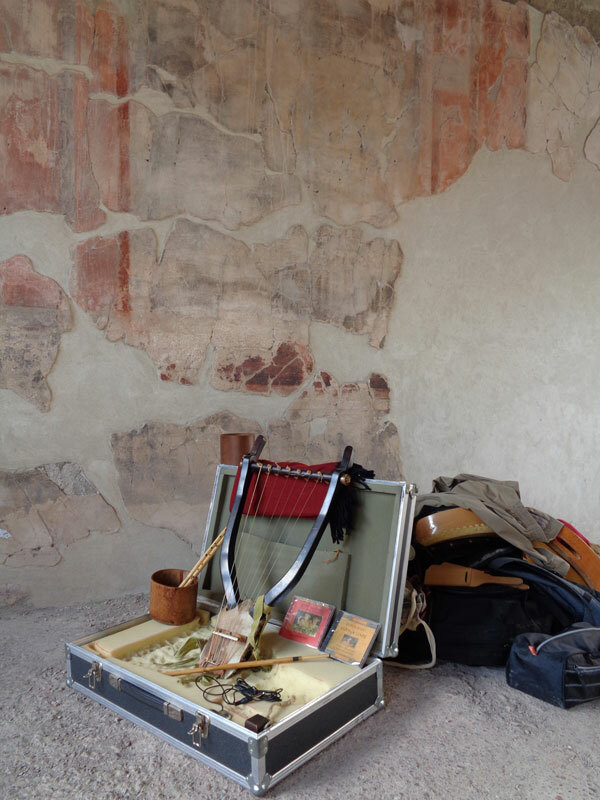 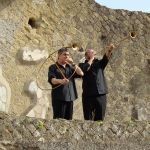 Two archaeomusical performances in the Archaeological Park of Herculaneum: from 3:00 PM to 6:00 PM, the Ludi Scaenici group will play some ancient instrument replicas, carefully reconstructed by studying the original materials, making analyses and experiments. 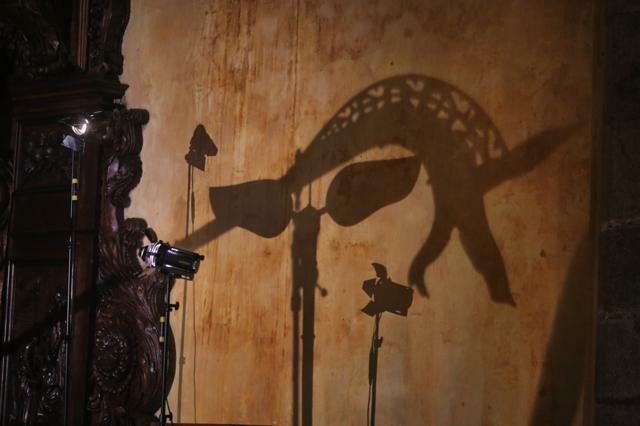 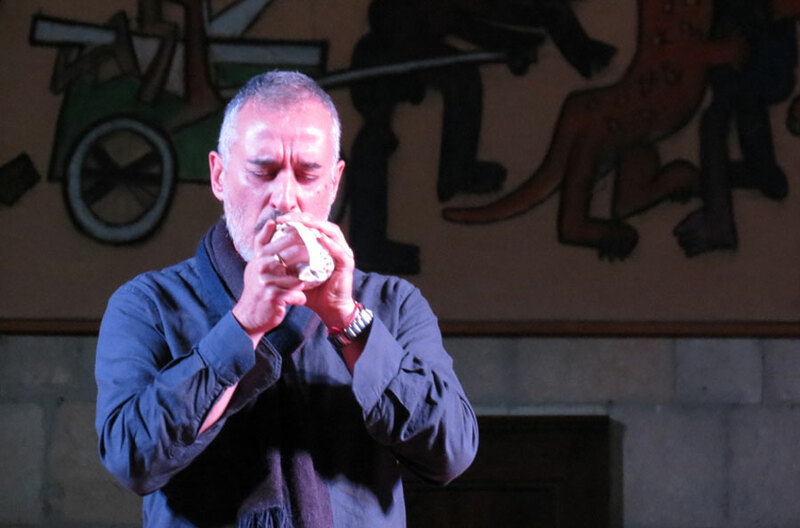 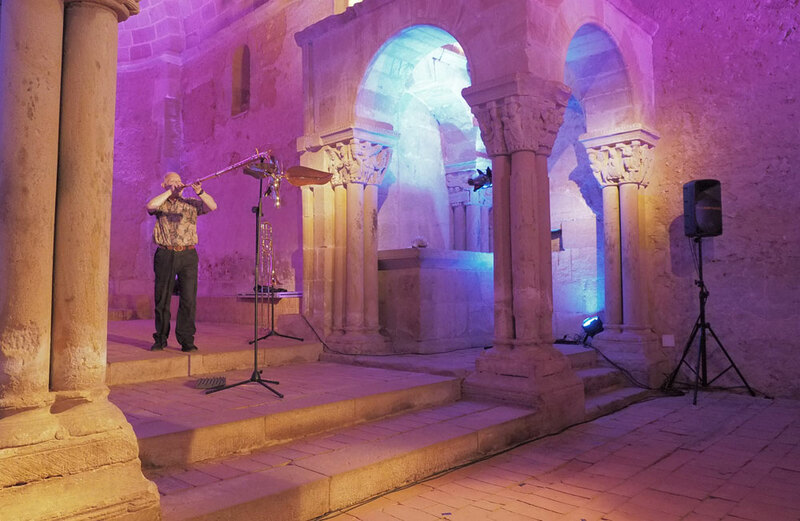 At 6:00 PM, the Tangatamanu group along with the photographer Pino Ninfa will lead the audience on an original journey into time using light and sound, ancient musical instruments and traditional instruments of the Mediterranean area together with modern technologies. 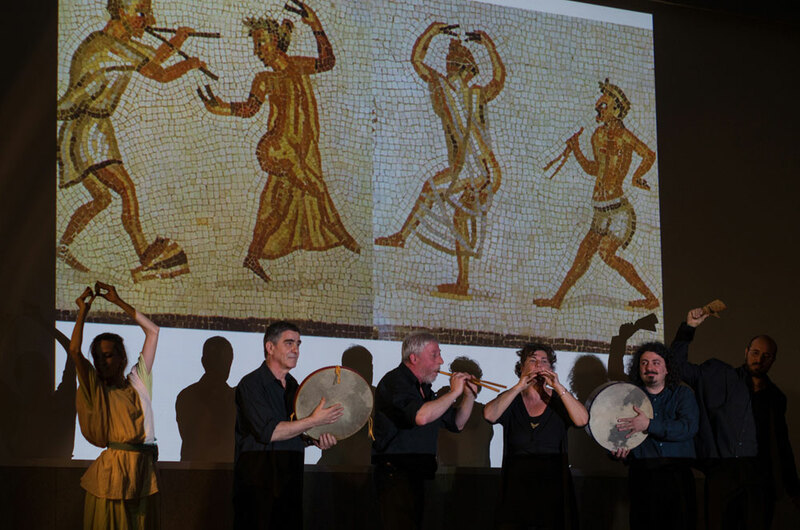 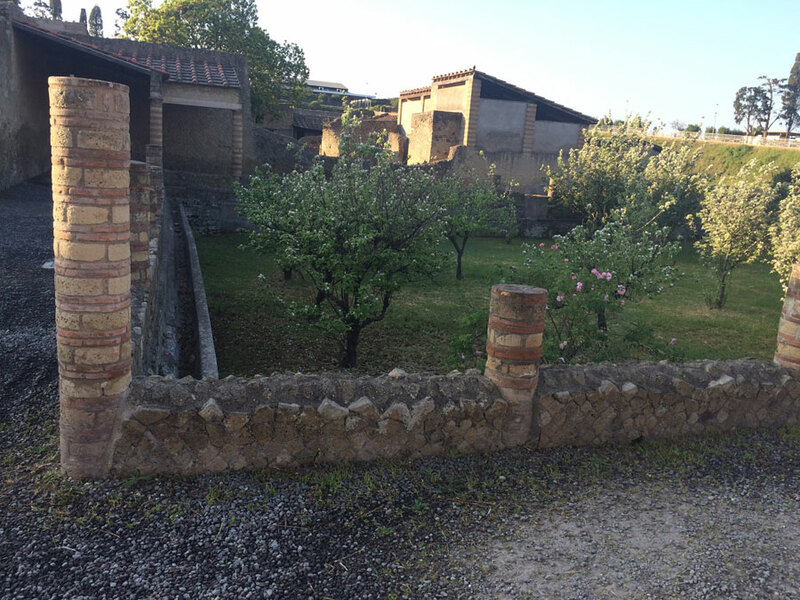 During the event, realized with the contribution of the Municipality of Tarquinia, the results of the European Music Archaeology Project and the collaboration agreement between the Archaeological Park of Herculaneum and the University of Tuscia will be presented. 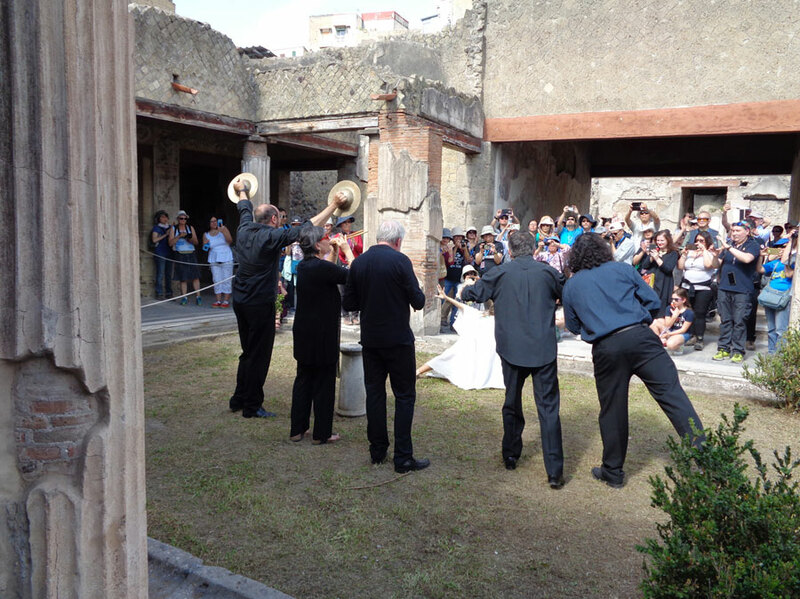 The regular ticket to the archaeological area includes the concerts. 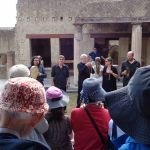 This musical unit presents glimpses of Roman games and ceremonies, fragments from the Latin literature and also some insights on the popular music performed at that time. 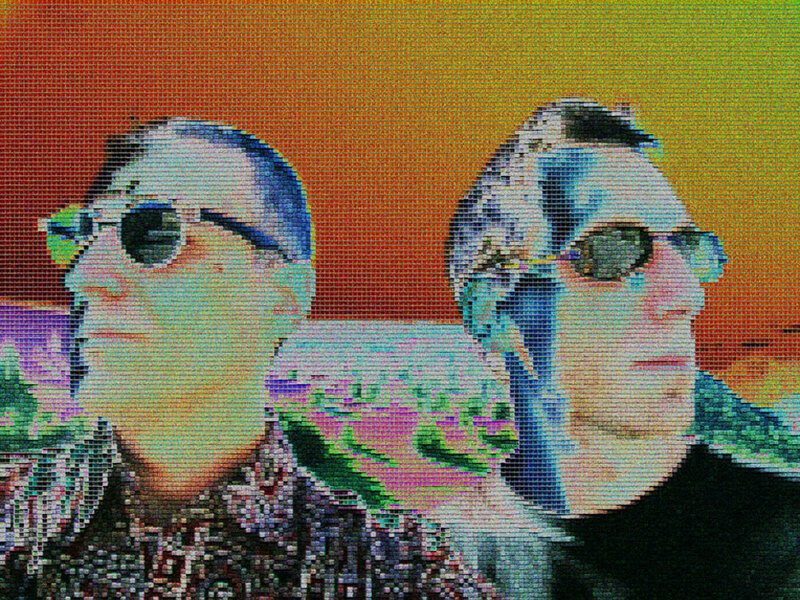 Postcards from a travel into time and space, surfing on the sound waves of single-, double- and triple-pipe, from Paleolithic caves to the end of the 1st Millennium. 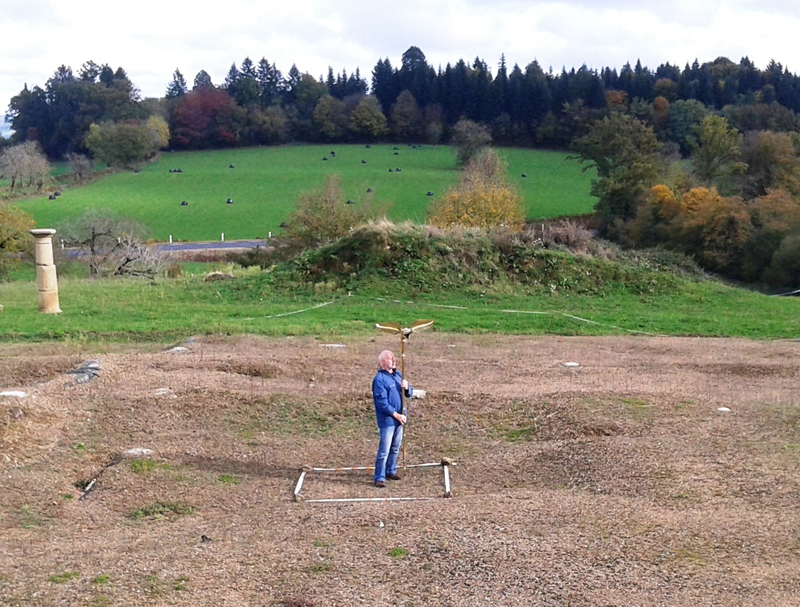 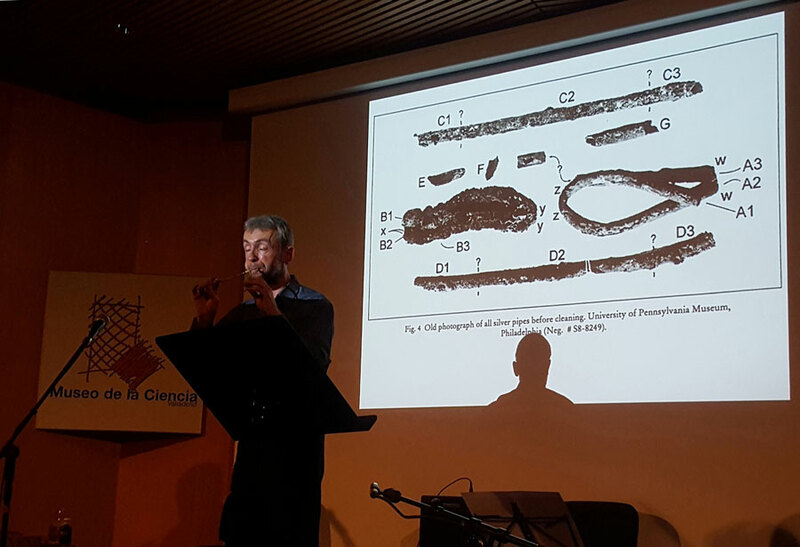 Barnaby Brown: prehistoric pipes from Hohle Fels and Isturitz, double pipe from Ur, aulòs, launeddas, triple-pipe. 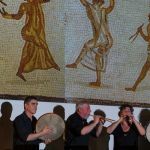 Celtic and Etruscan symbols of the highest rank, the long trumpets known as carnyx, lituus and cornu finally are singing again, after a very long silence. 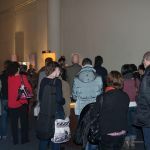 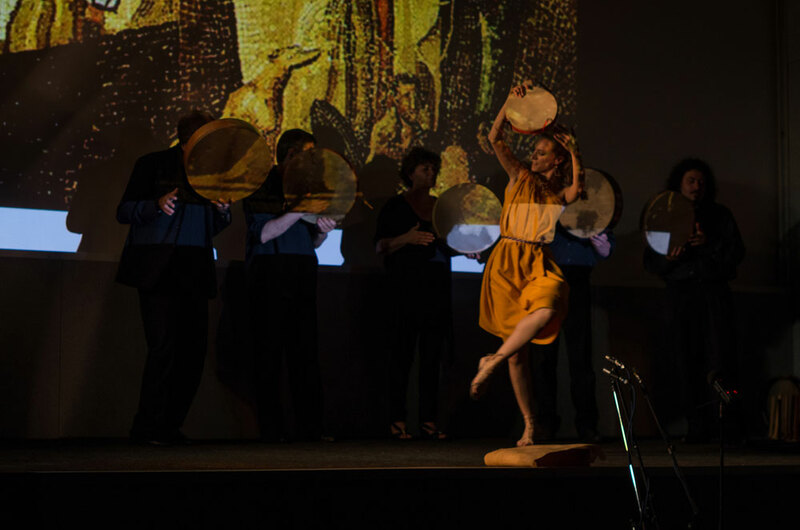 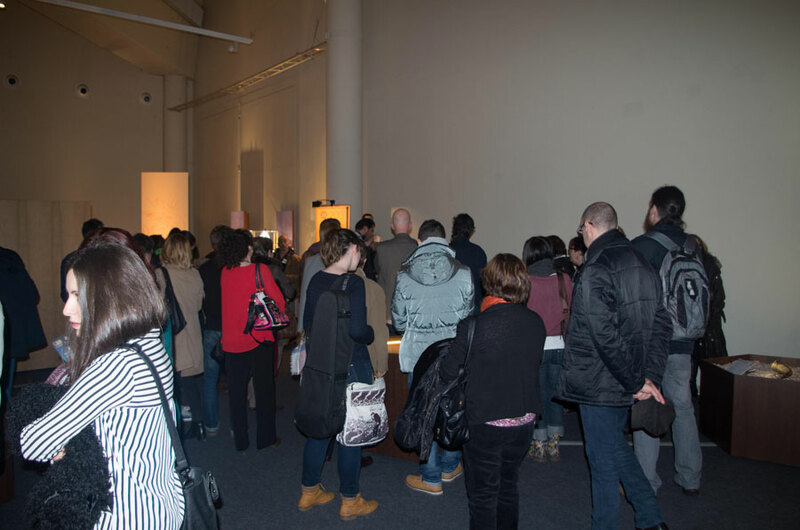 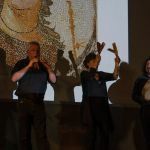 The performance of the Ensemble Mare Balticum & Miriam Andersén, Arqueoescena and Ludi Scænici opened the ARCHÆOMUSICA exhibition, which shows and shares with the audience the carnyx and other musical instruments made in the frame of the EMAP (European Music Archaeology Project). 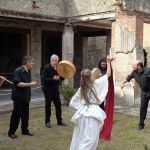 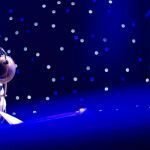 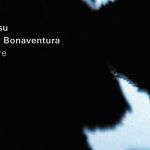 The musical project is produced by EMAP and this special event is presented in the framework of the musical season promoted by the Fondazione Musica per Roma. 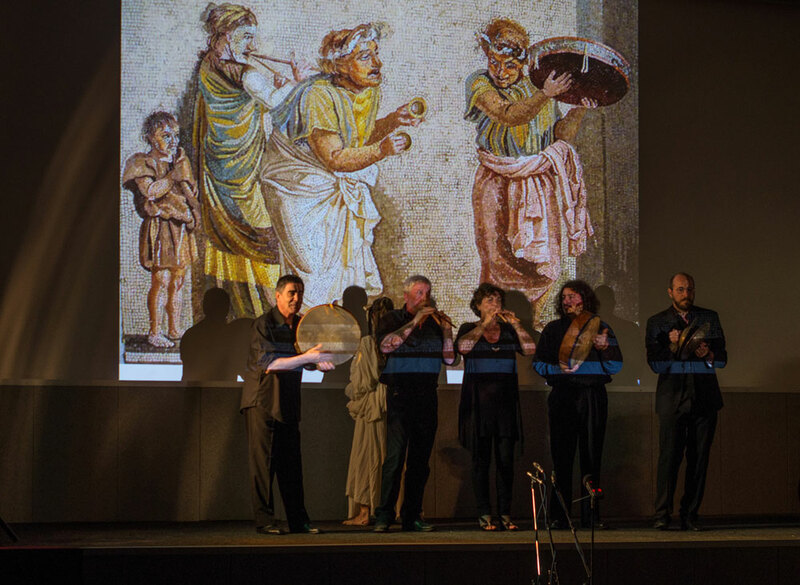 The concert is a preview of the EMAP’s travelling exhibition – ARCHÆOMUSICA – which is hosted in Rome, at the Parco Regionale dell’Appia Antica, from October 11th to December 10th. 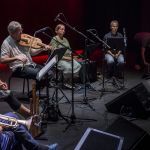 This double live show presents several EMAP groups and soloists playing an amazing array of the ancient instruments reconstructed in the framework of the Project, during the first pocket edition of the exhibition ARCHÆOMUSICA: musical instruments and sounds from ancient Europe. 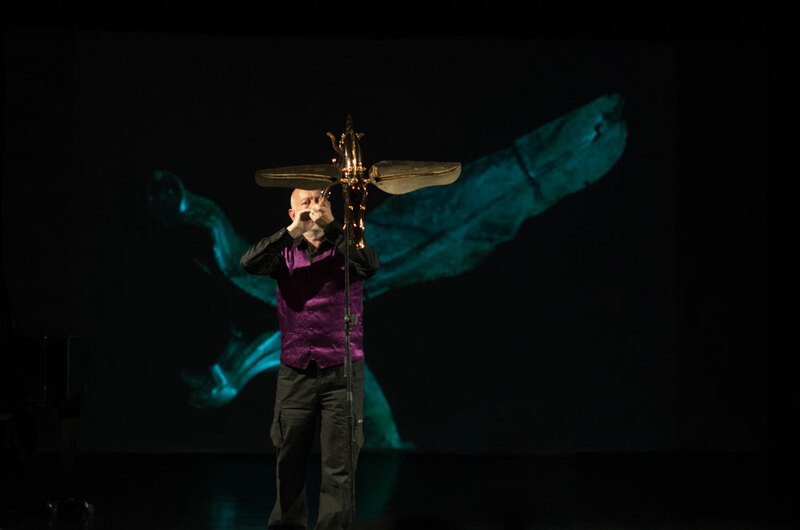 Audiovisual performance by Tangatamanu & Pino Ninfa (preview of the forthcoming EMAP exhibition Archæomusica: musical instruments and sounds from ancient Europe). 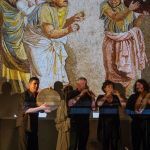 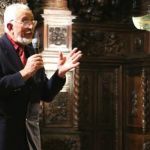 The Art Of The Muse: Stefan Hagel, one of the greatest music experts of antiquity, proposes a tour of the earliest written melodies, presenting echoes of Greek musical culture, with instruments as kitharas, lyres and auloi. 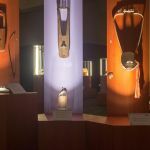 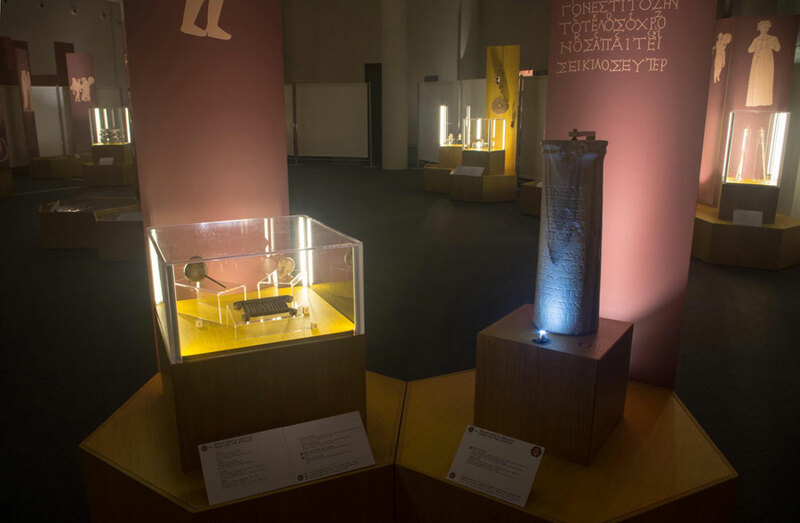 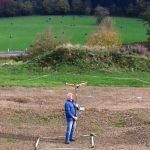 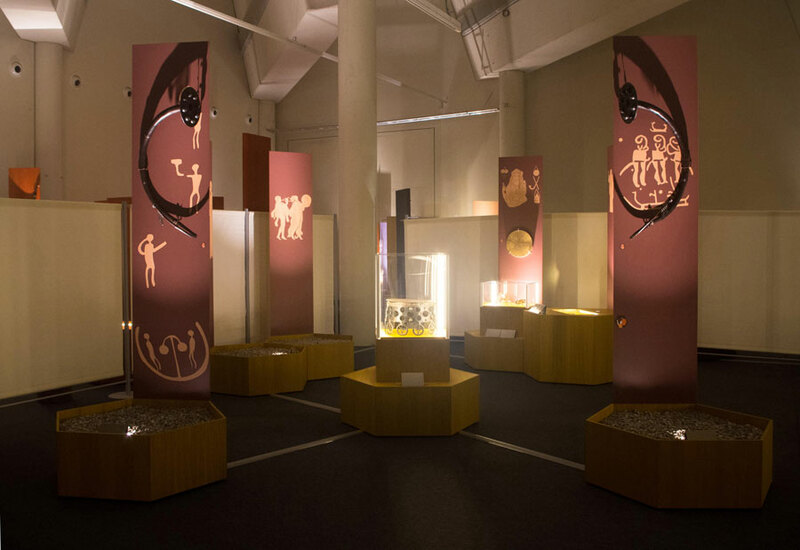 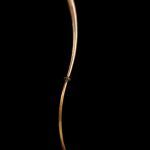 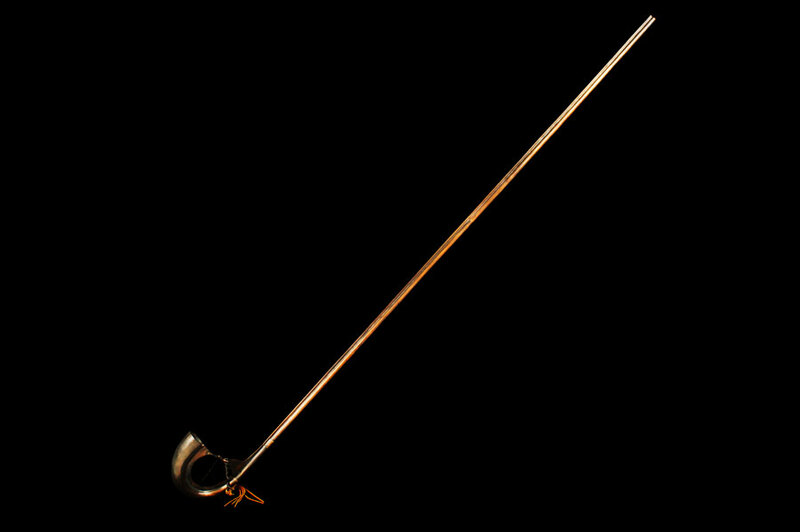 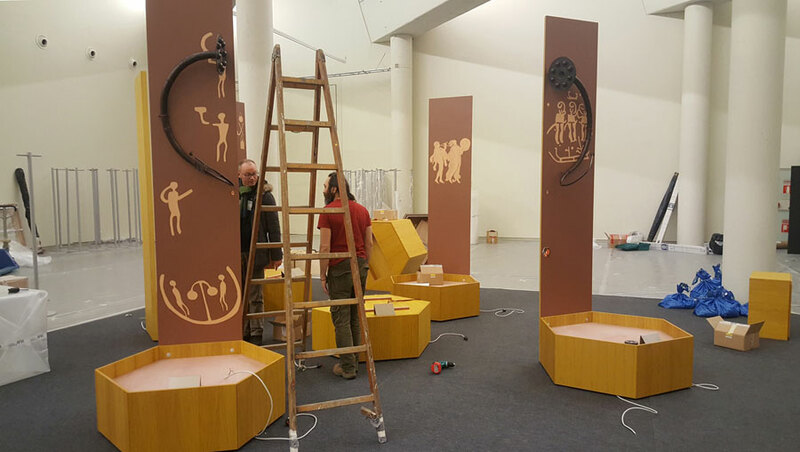 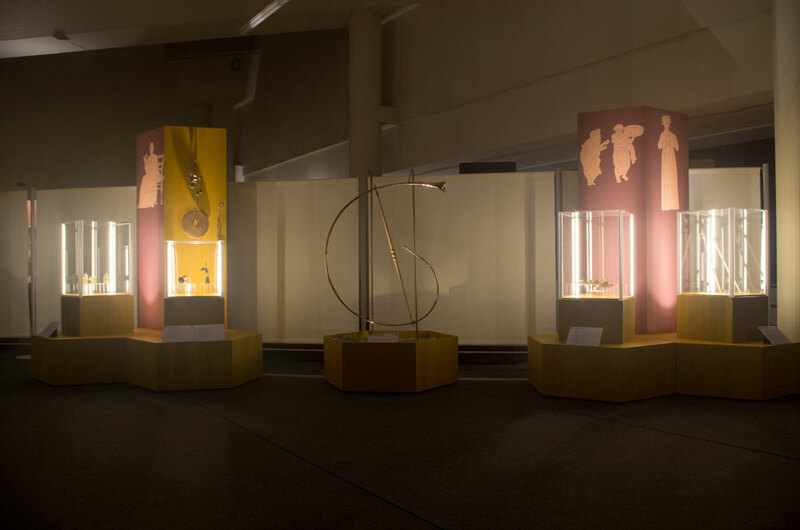 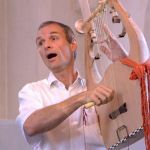 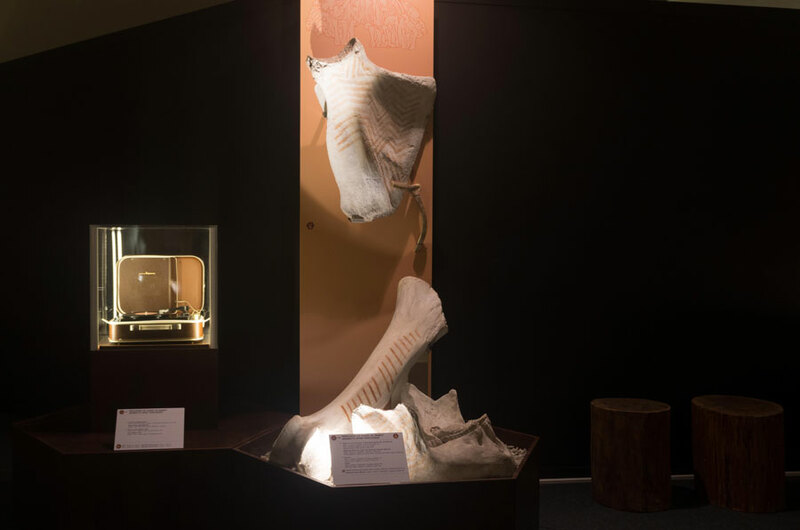 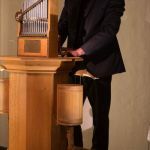 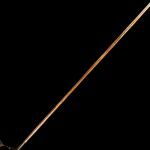 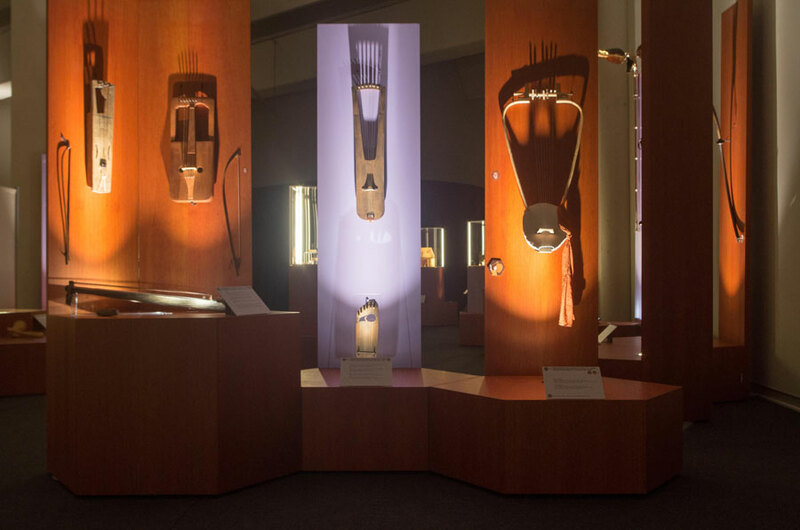 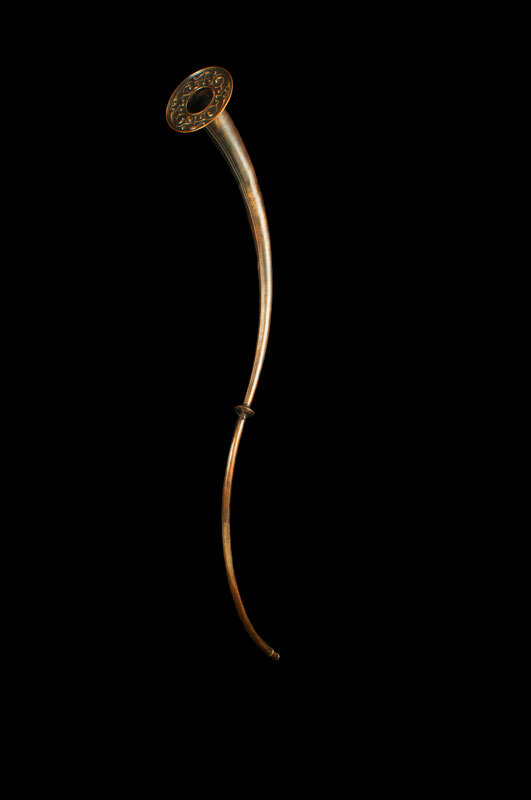 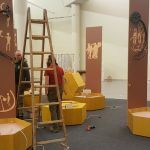 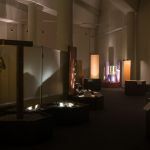 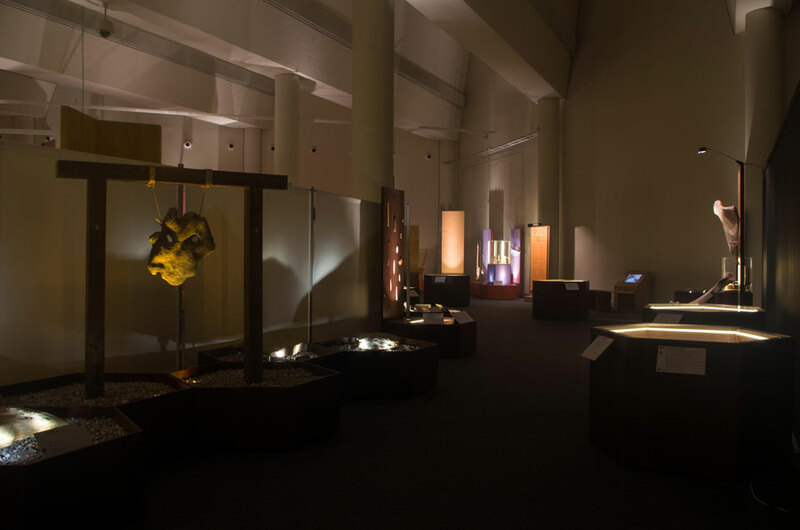 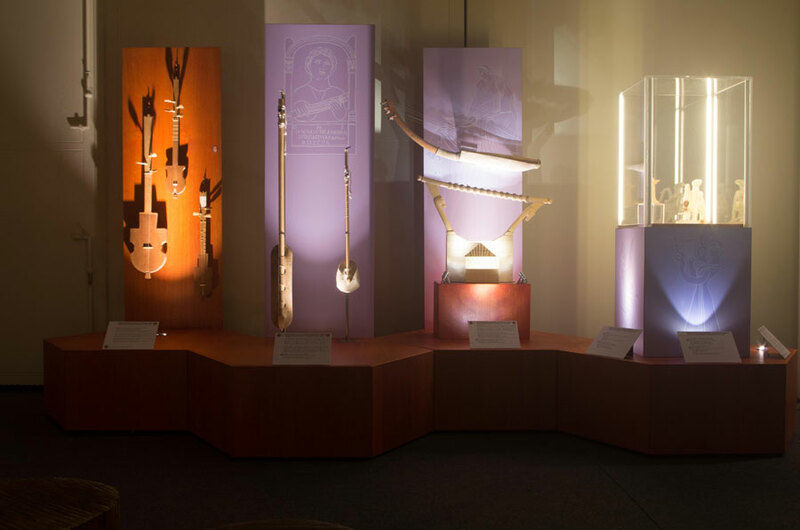 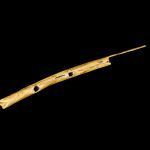 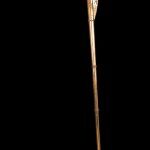 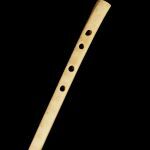 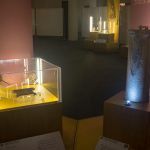 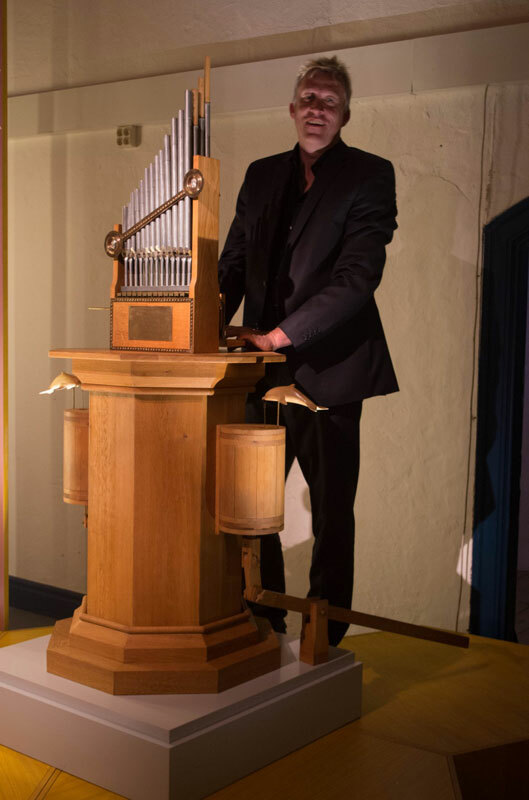 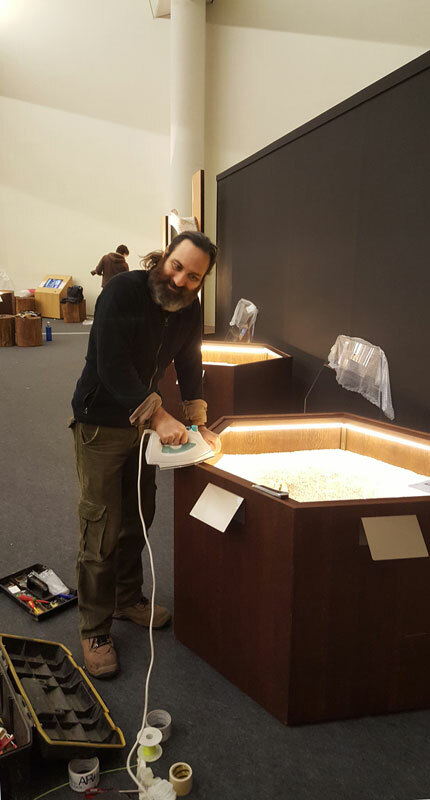 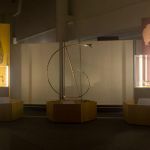 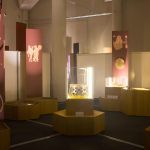 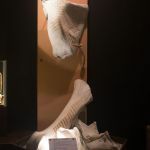 Hydraulis: With the magnificent reconstruction of a hydraulis showed in the Arqueomúsica exhibition, Justus Willberg will unveil all the secrets of the first key instrument of history. 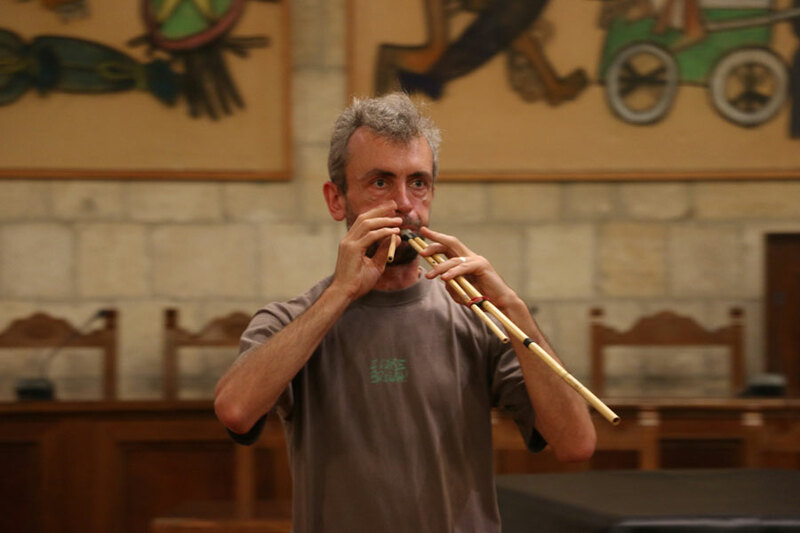 In addition, he will play other Roman instruments with the Ludi Scaenici group. 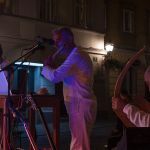 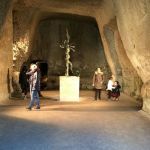 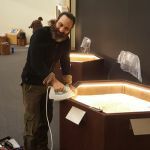 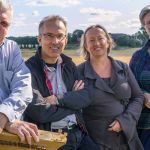 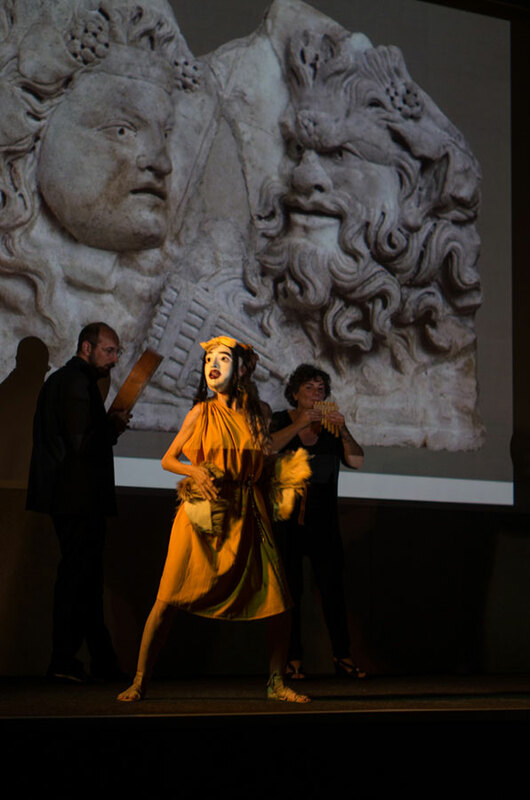 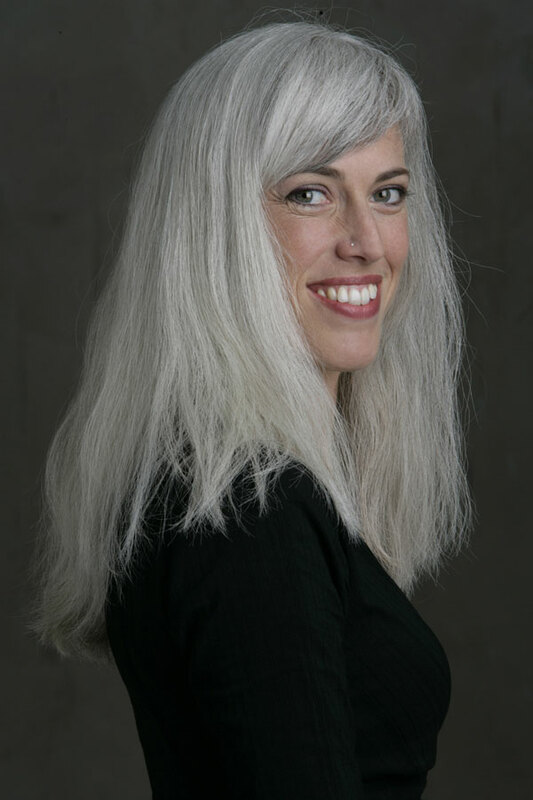 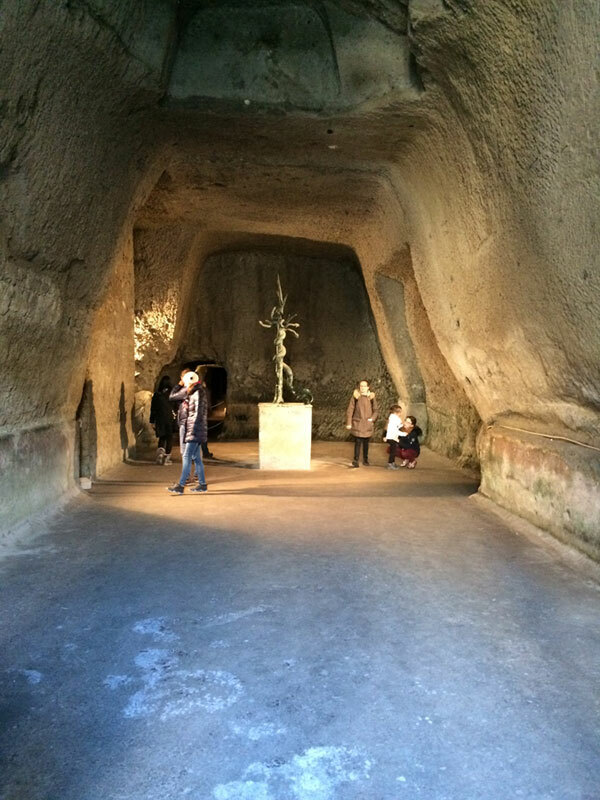 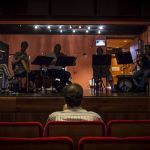 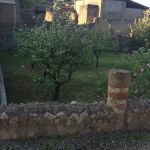 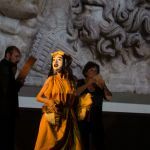 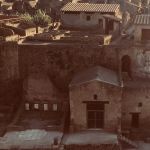 Soundscapes of Rome: through reconstructions of archaeological tools, Ludi Scaenici approach the game music and celebrations in Rome, taking fragments of Latin comedy and experimenting with possible popular music of the time. 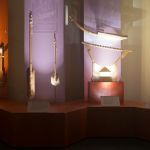 EMAP exhibition – ARQUEOMÚSICA ¡Así sonaba la Europa antigua! 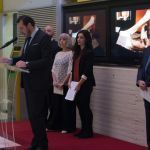 – has been inaugurated in Valladolid, Spain, on February 7th. 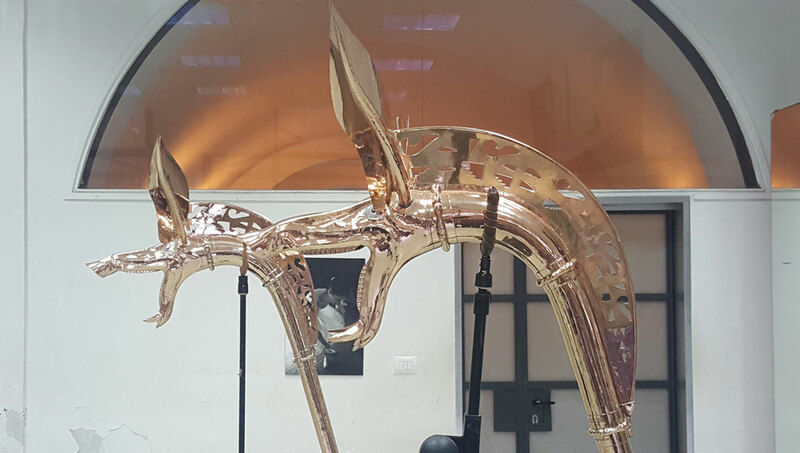 It will stay at the Museo de la Ciencia until May 21st, 2017. 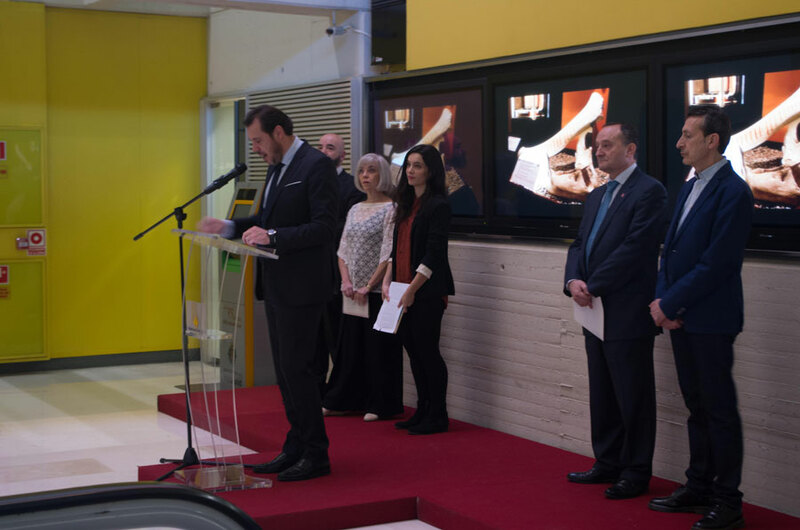 The Mayor of Valladolid, the Dean of the University and members of the EMAP team gathered together for celebrating the occasion. 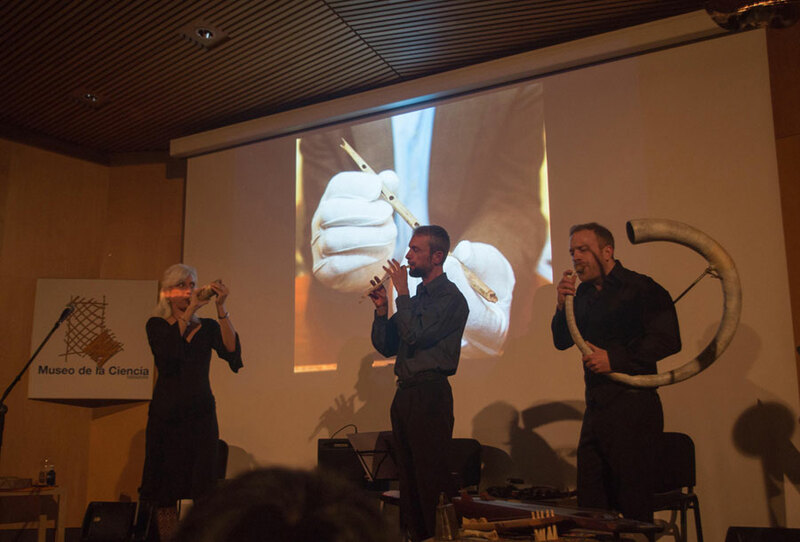 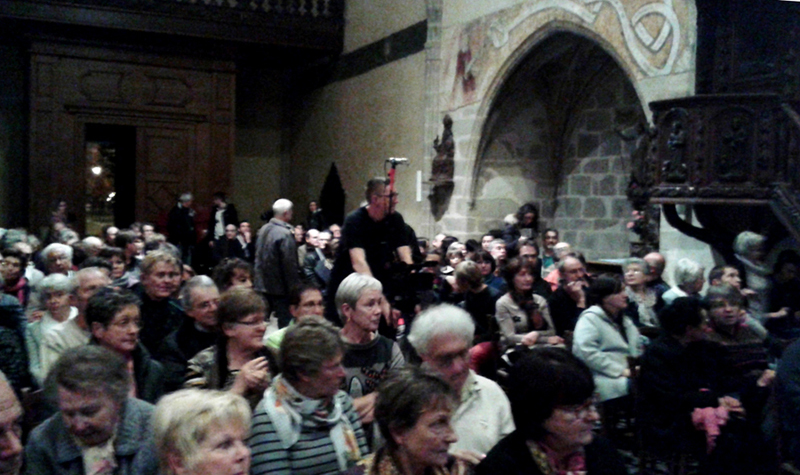 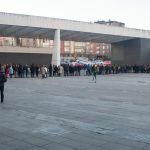 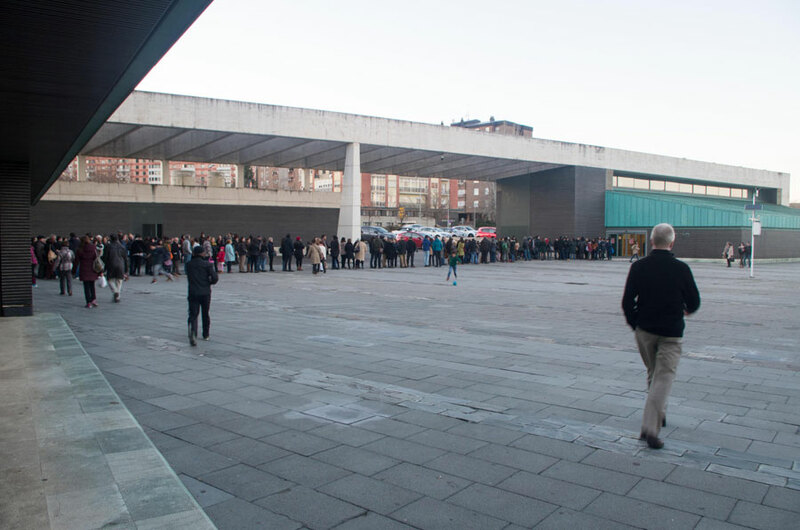 The exhibition’s opening was accompanied by a musical event, which had a remarkable success: more than 500 people showed up for the concert, but, unluckily, some of them could not attend it because the full capacity of the auditorium was reached swiftly and, therefore, two of the EMAP musicians got out of the venue and showed at least some of the wonderful instruments to a grateful audience. 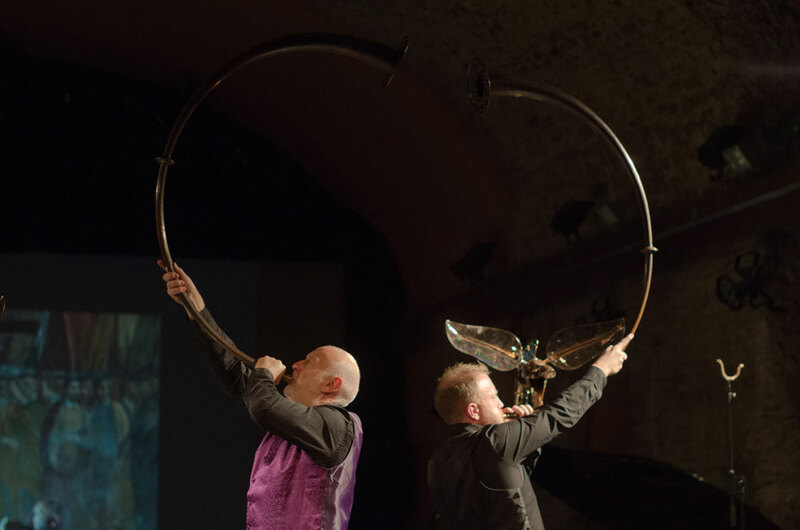 Patrick Kenny played the magnificent brass instruments from ancient Europe, Barnaby Brown performed on single, double and triple pipes from different ages and places, Miriam Andersén presented an amazing journey through Viking music and poetry, and Arqueoescena concluded the event performing Greek musical fragments. 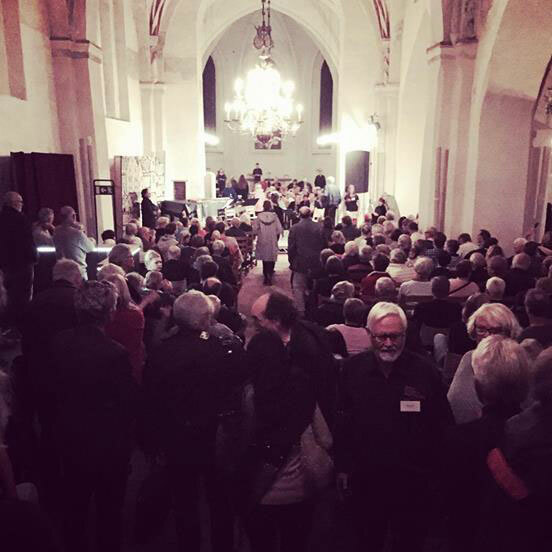 November 27th, 2016, at 17:00 – Venue: The Abbey Church, St Petri Kyrkoplan, 27160 Ystad, Sweden. 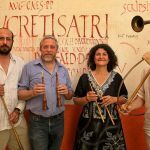 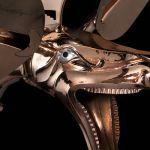 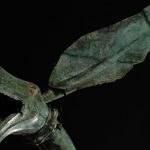 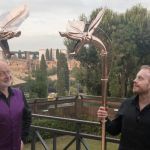 Mighty Voices of Bronze and Power: symbols of the highest rank among Celts and Etruscans, the awesome trumpets known as carnyces and litui by ancient Greeks and Romans, finally, are singing again after a very long silence. 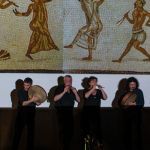 Mediterranean Soundscapes: a weaving of sounds, blending ancient and ethnic instruments with electronic samples and drones, to share a collective dive into the stream of time and celebrating the oldest Mediterranean ancestors. 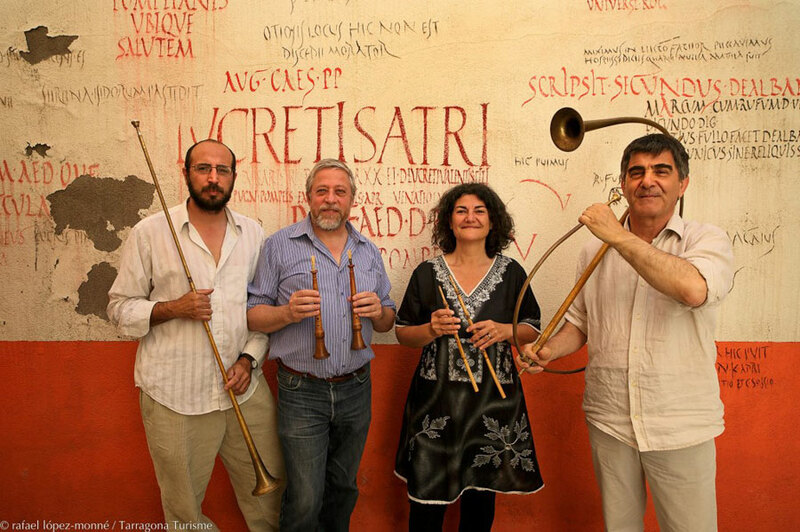 This concert will feature music originally included in the CD “The Voice of the Carnyx”, in the new EMAP CD “Dragon Voices: The Giant Celtic Horns of Ancient Europe” and in the soundtrack produced for the multimedia installation of Pani Loriga, a Phoenician-Punic site in Sardinia. 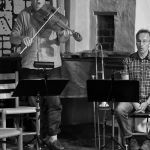 August 20, 2016, at 18:00 – Venue: the Abbey Church, St Petri Kyrkoplan, 27160 Ystad, Sweden. 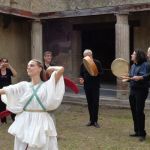 Classical Antiquity is the only music culture of the more distant past that has left written melodies in addition to a wealth of music-related literature and artwork. 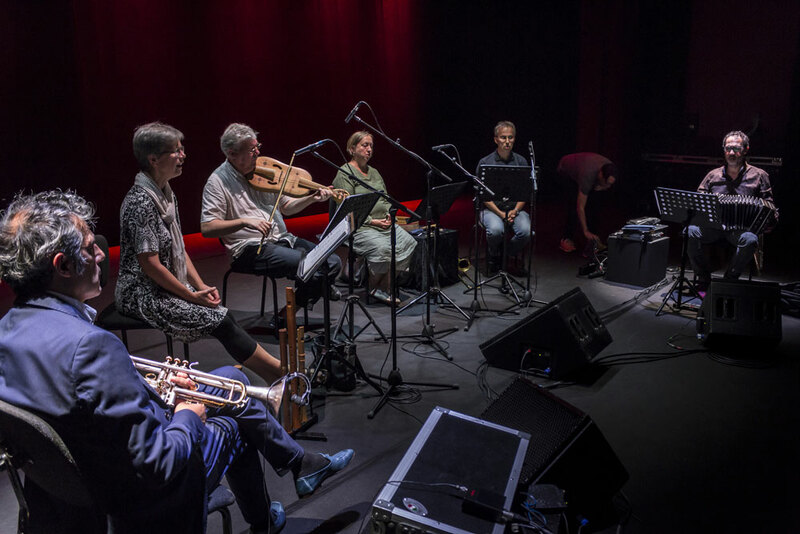 Ensemble Kelethmos combines the scholarly expertise of Dr. Stefan Hagel, Vienna, with the art of the Greek singer Rosa Poulimenou and British piper Callum Armstrong in bringing that music back to life. 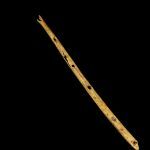 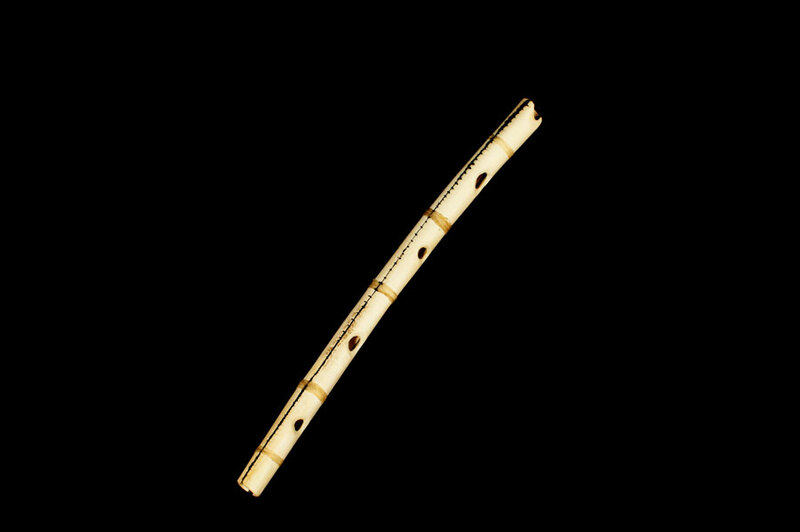 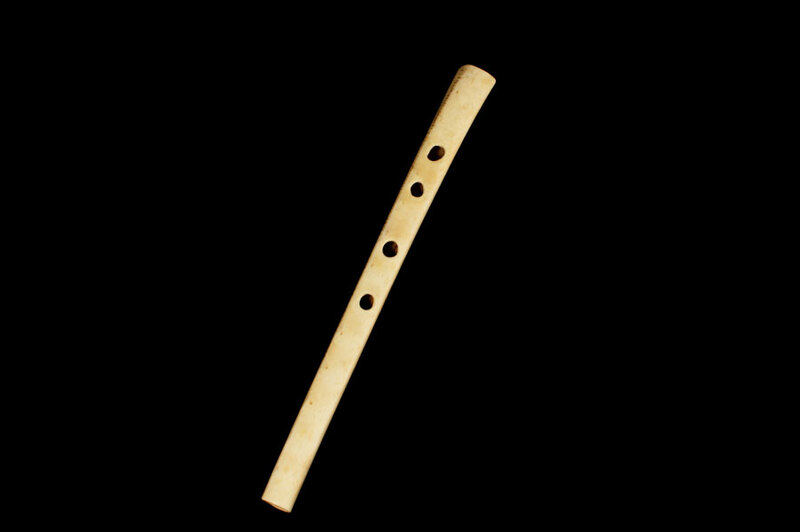 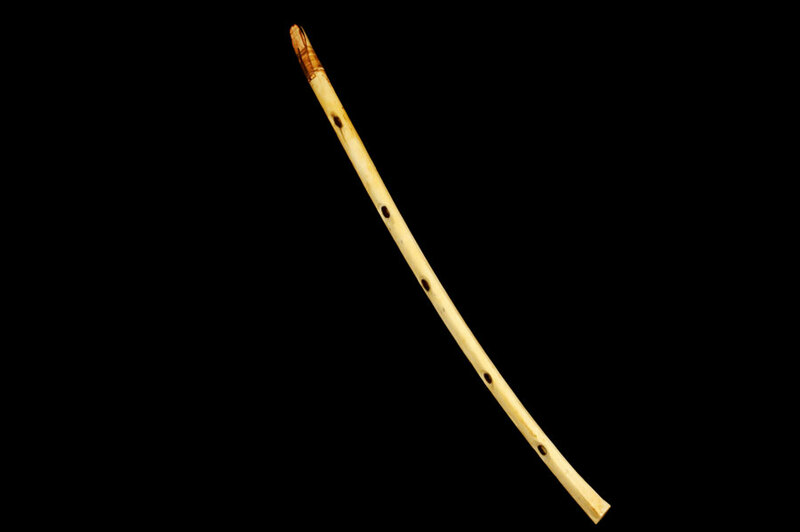 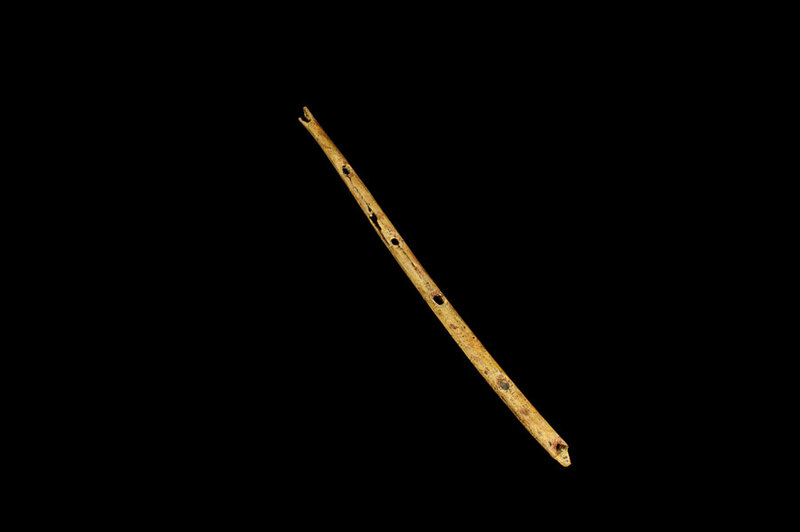 Its hallmark is scientific rigour in reconstructing and playing ancient instruments, notably the concert kithara and various kinds of double pipes. 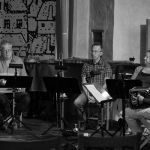 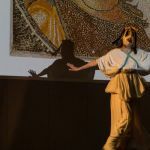 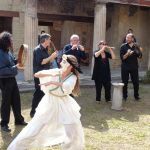 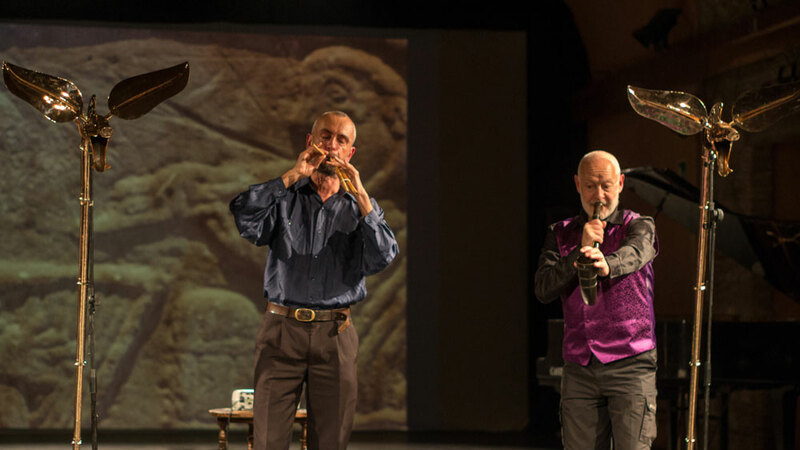 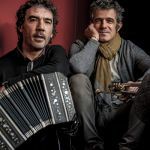 Their performances include surviving songs from Hellenistic and Roman times as well as re-compositions and improvisations reaching as far back in time as the beginning of European literature. 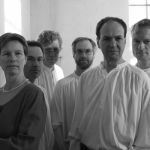 Ensemble Mare Balticum is the early music ensemble of the regional music institution Musik i Syd and the only Swedish full-time ensemble in this category. 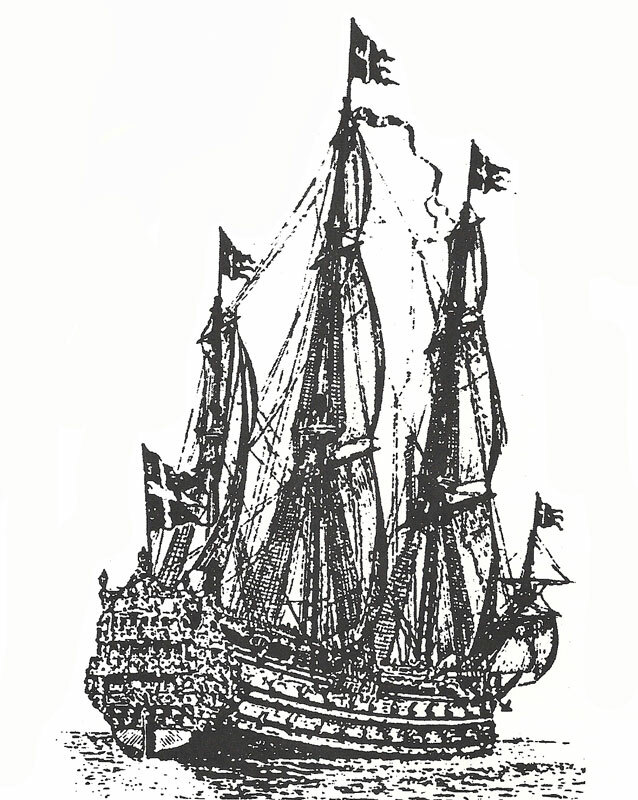 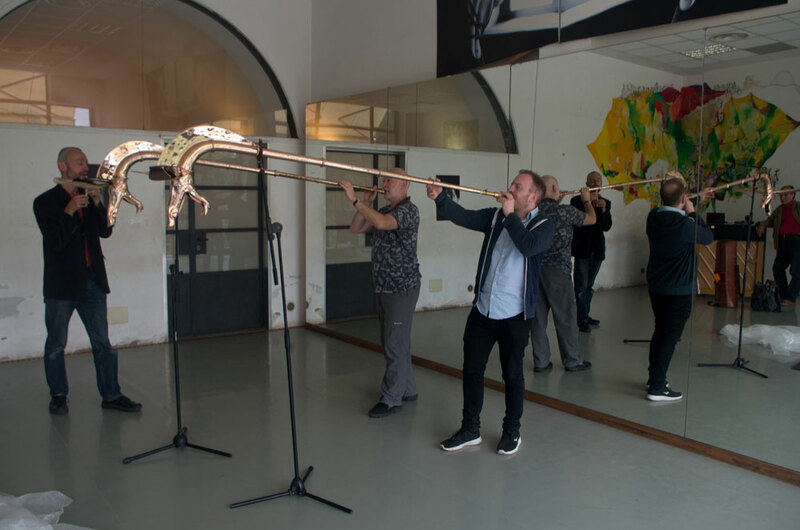 The musicians play on the same types of musical instruments that were found on the wreck of the Royal Swedish Flagship Kronan (the Royal Crown), which exploded and sank in the Baltic Sea in 1676. 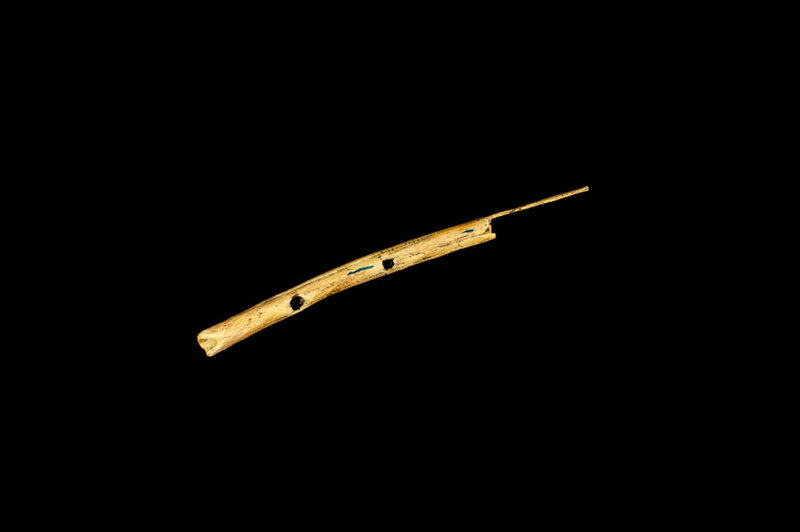 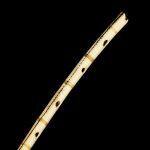 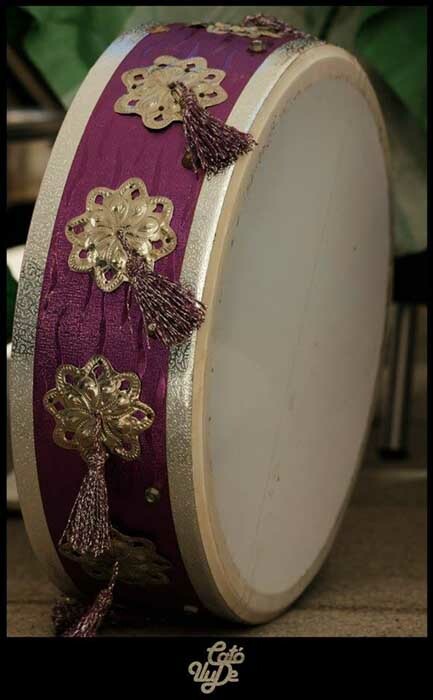 All wind instruments, stringed instruments and percussions are represented in the finds that have been retrieved. 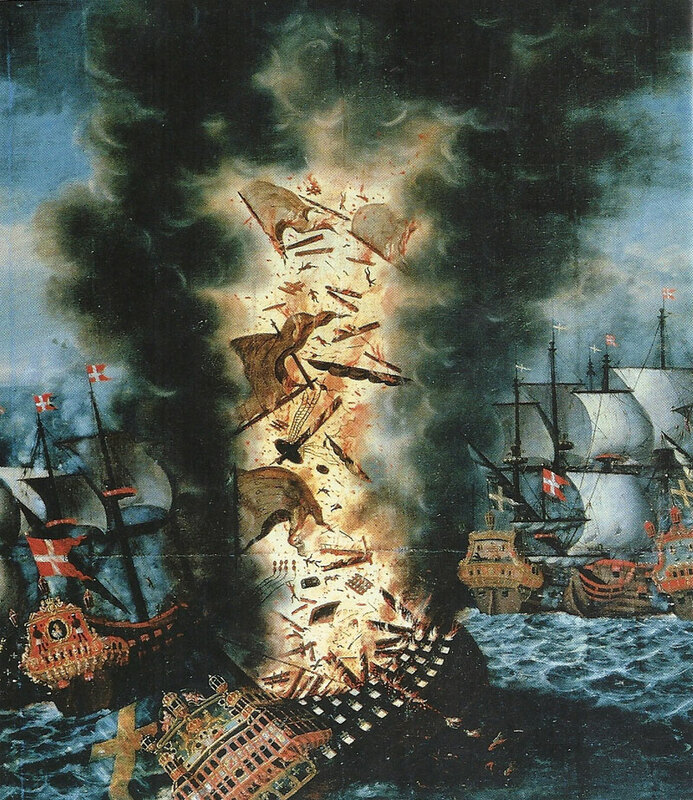 Of the 842 men in the crew only 40 were saved. 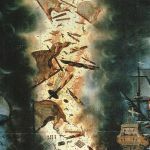 The wreck has been called “Pompeii of the Baltic Sea”. 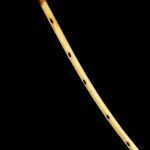 Who performed music on board, for whom was the music intended, when and what did they play? 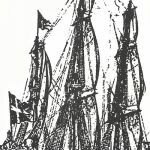 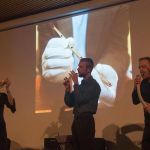 The concert contains music that may have been performed in different contexts on board Kronan: in the Admiral’s cabin, at the Regimental Prayer, in the Officers’ cabin and at the Sailors’ work. 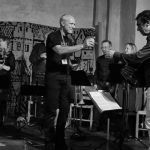 August 3, 2016, at 22:30 – Venue: The Abbey Church, St Petri Kyrkoplan, 27160 Ystad, Sweden. 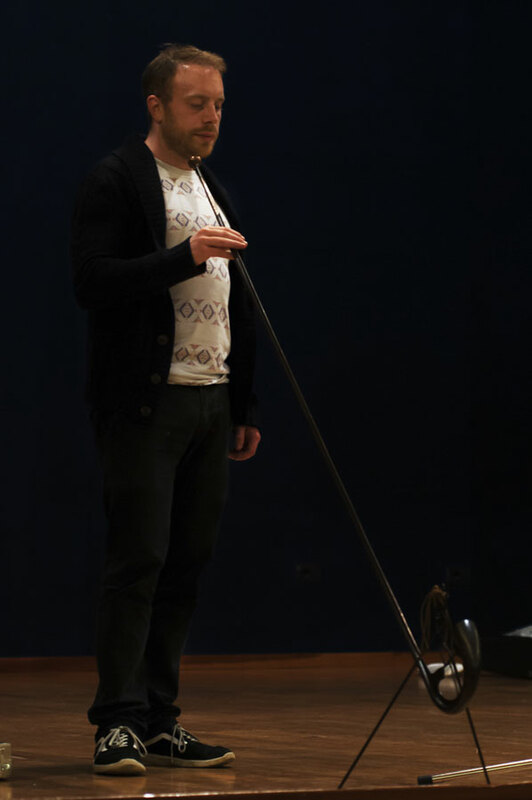 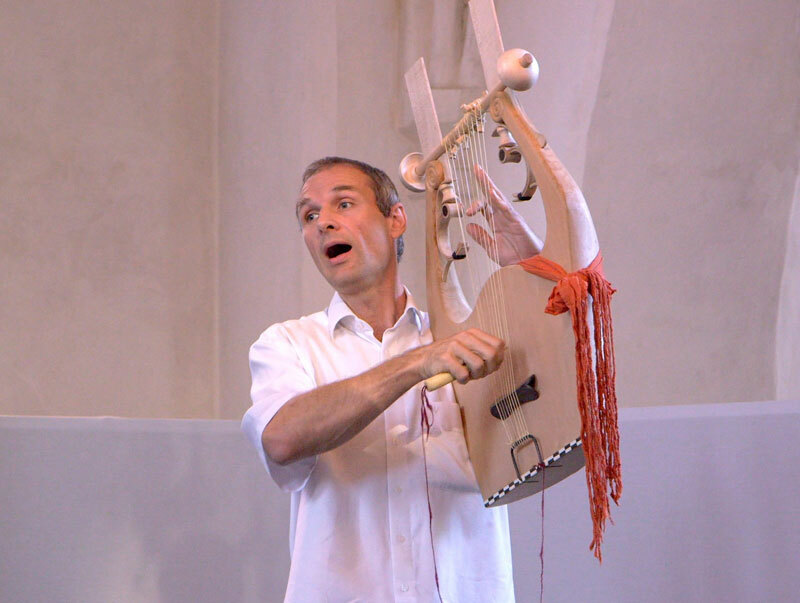 Stefan Wikström (SE) – sackbut, percussion. 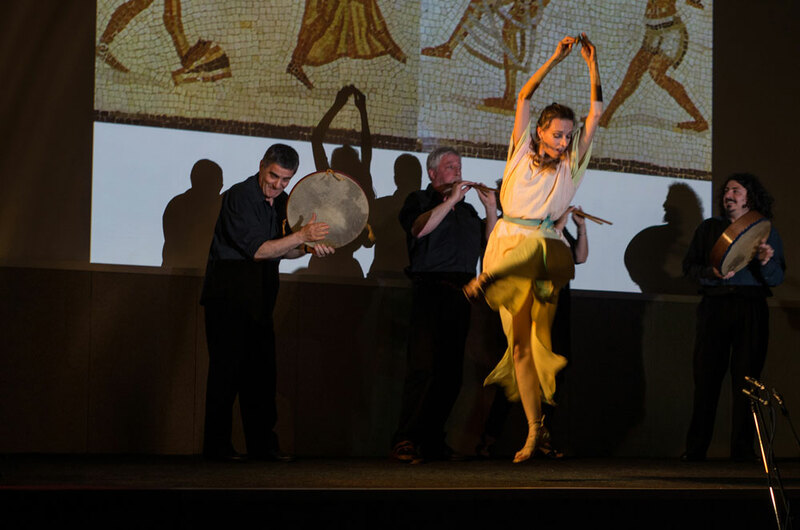 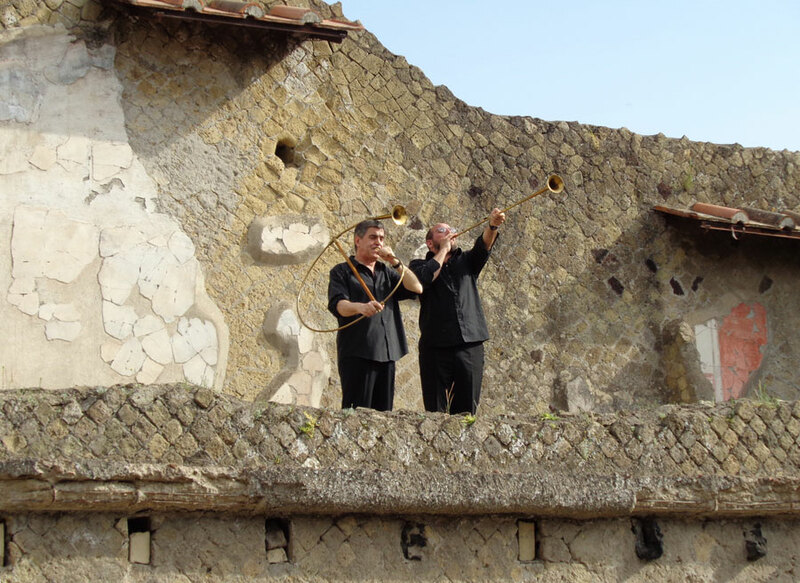 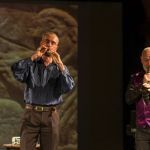 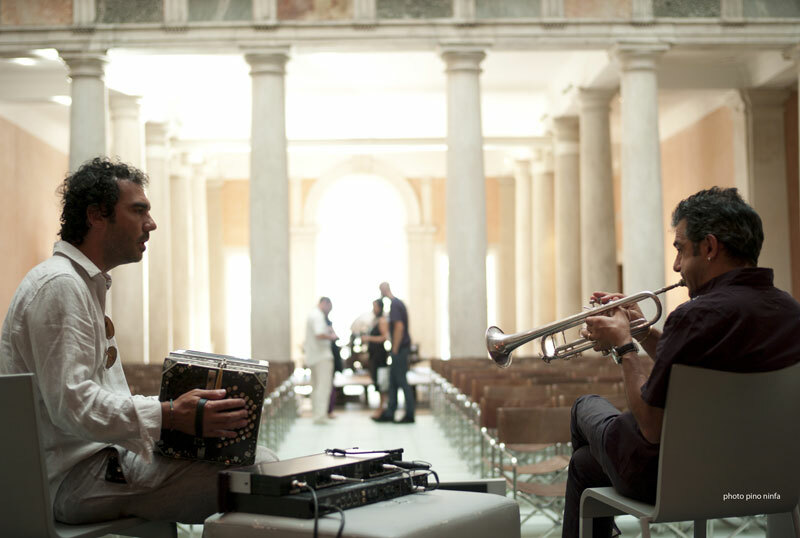 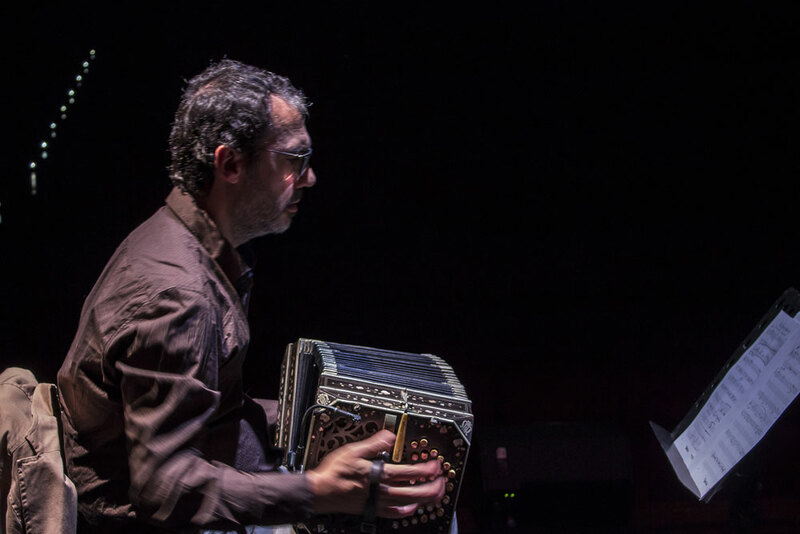 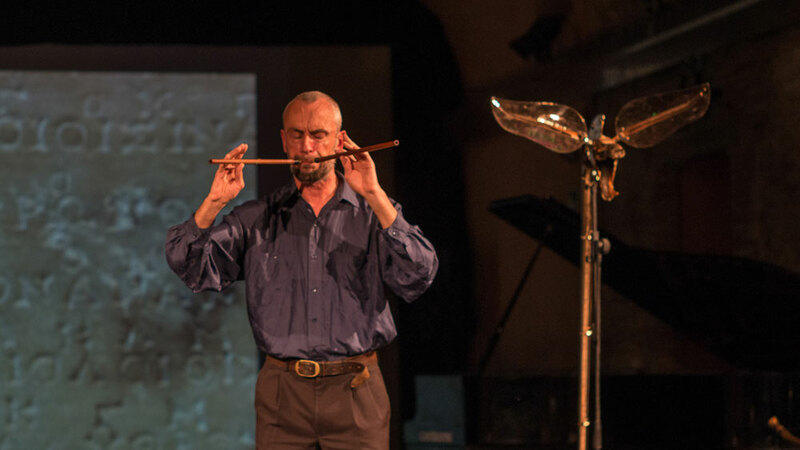 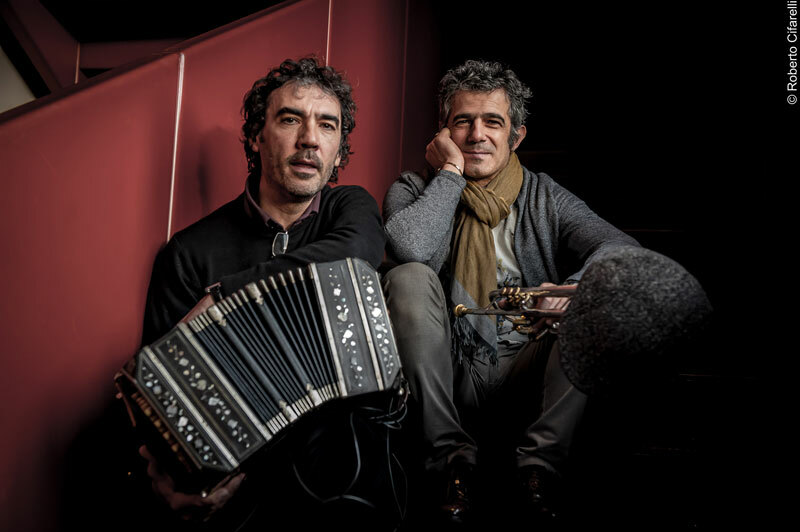 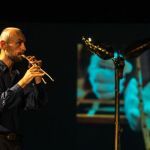 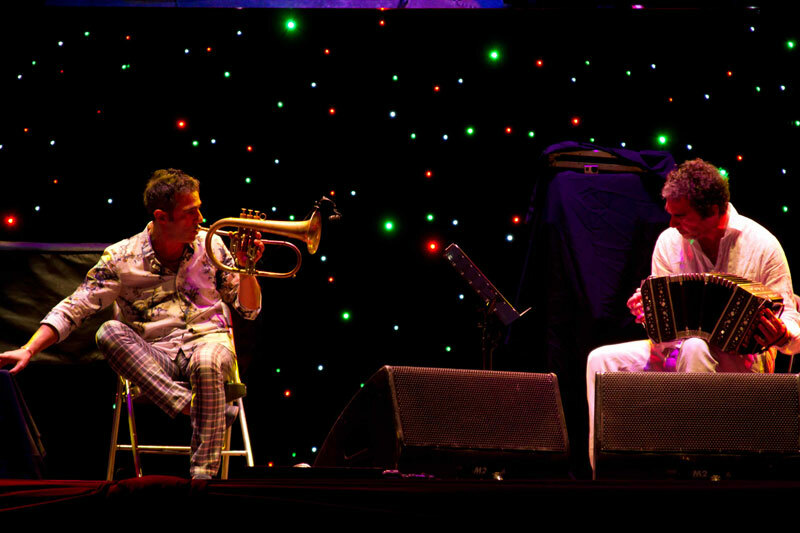 Paolo Fresu & Daniele di Bonaventura presented their latest musical production as a duo – In maggiore – (published by ECM in 2015) and a special project featuring ancient music and songs – Hits of the ancient Hellenes and Early Europeans – performed along with musicians from Ensemble Mare Balticum. 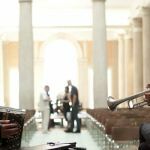 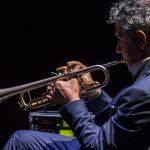 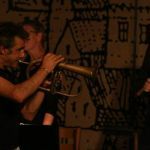 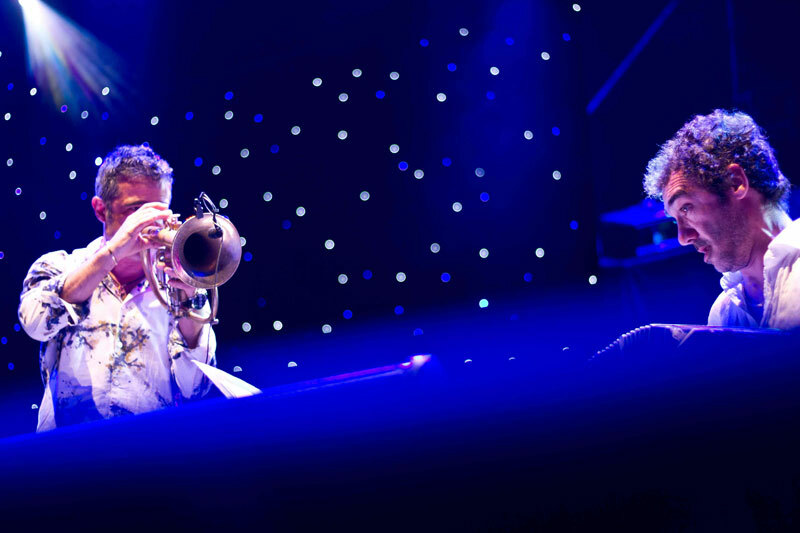 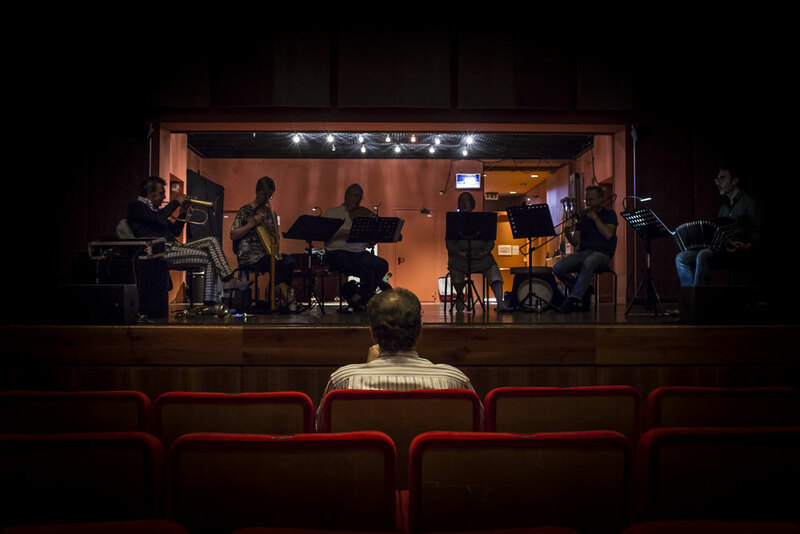 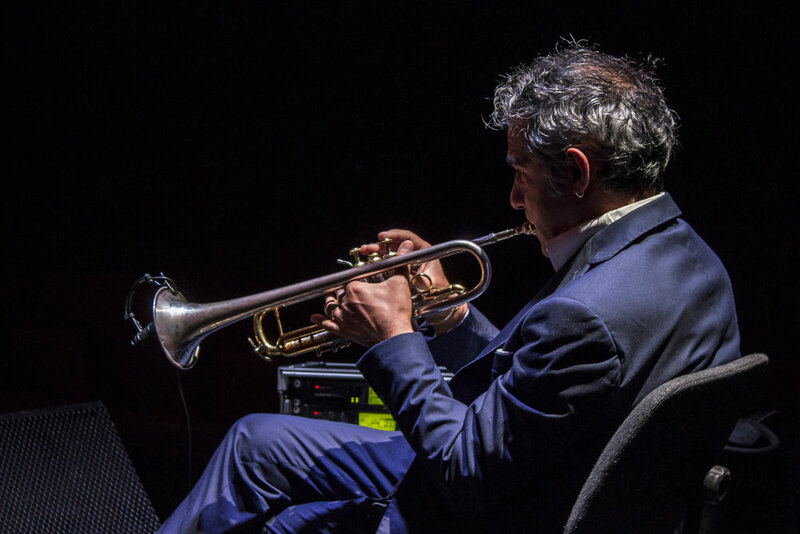 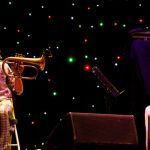 This special concert has been co-produced by the European Music Archaeology Project (EMAP) – coordinated by the Municipality of Tarquinia, Italy – and the Ystad Jazz Festival. 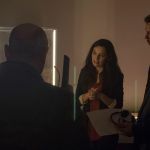 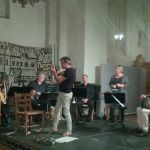 It has been performed at Ystad Abbey within the framework of EMAP’s travelling exhibition – Archæomusica – which is hosted there from June 6 to January 8. 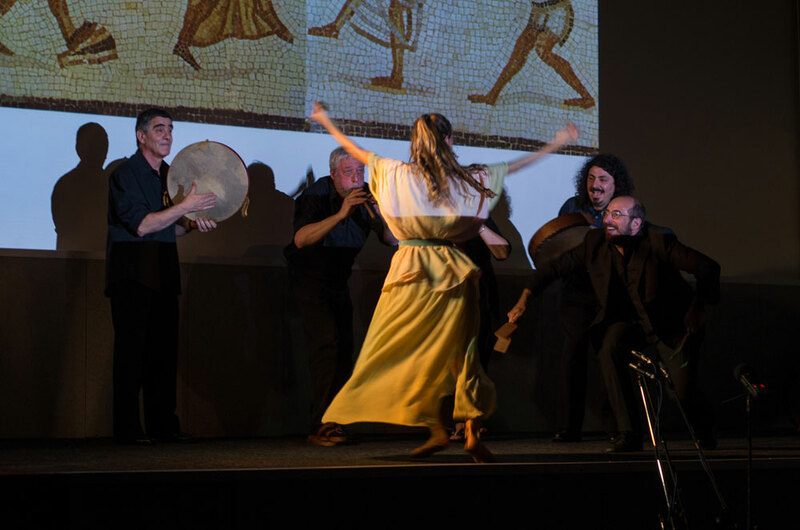 The concert featured an exclusive session where ancient Greek music, the earliest Nordic songs and the Italian laude have met present-day jazz from southern Europe – Italy! 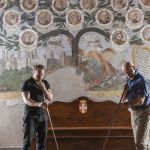 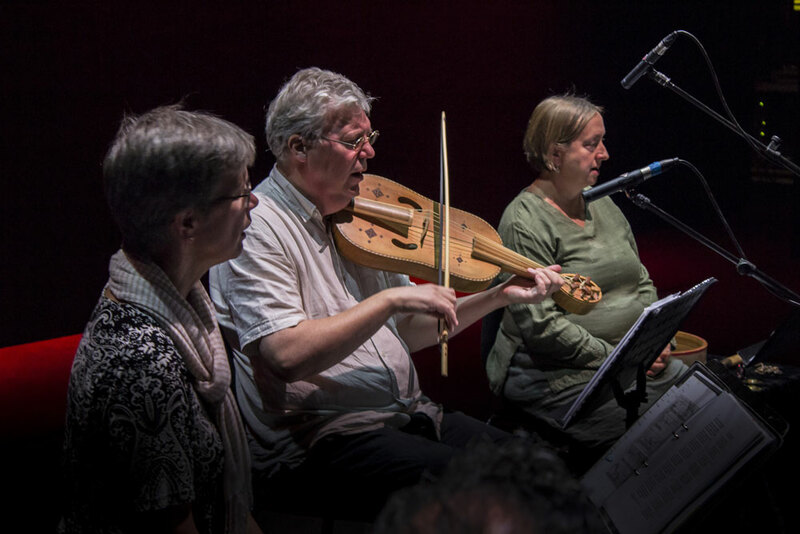 The ancient scores have been performed by musicians from the Ensemble Mare Balticum – a Swedish group specializing in early music – side by side with the brand-new arrangements and improvisations of the Italian duo. 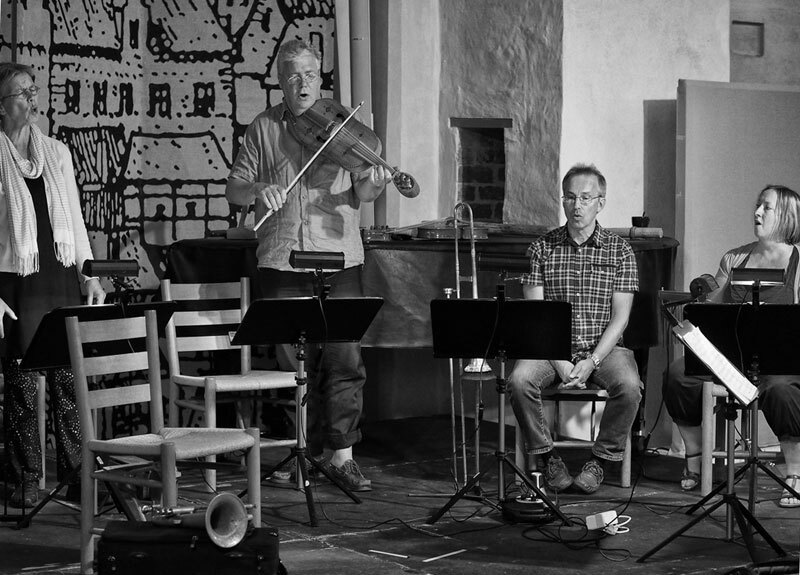 July 16th, 2016, at 18:00 - Venue: The Abbey Church, St Petri Kyrkoplan, 27160 Ystad, Sweden. 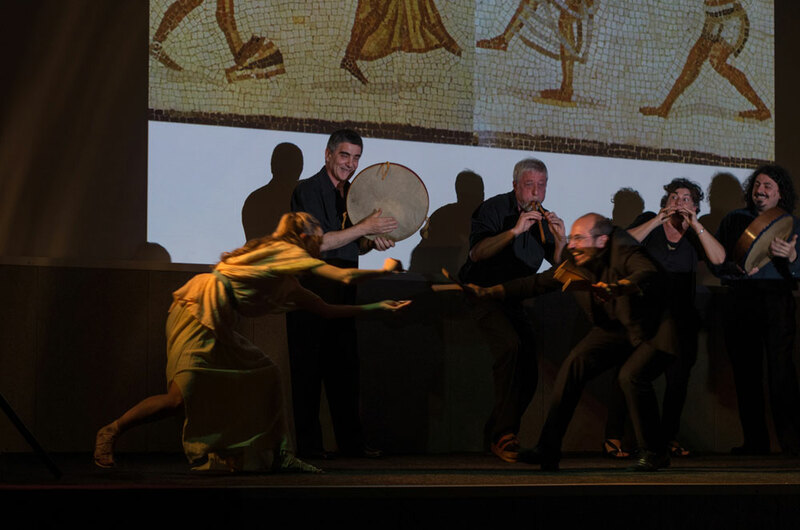 Glimpses of Roman games and ceremonies, frames taken from the Latin comedy and also some insight on the popular music performed at that time, with the Ludi Scænici and Justus Willberg. 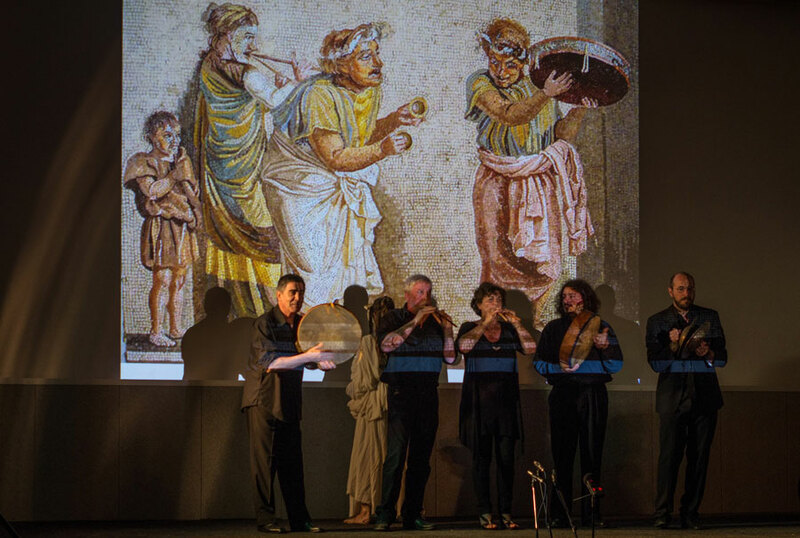 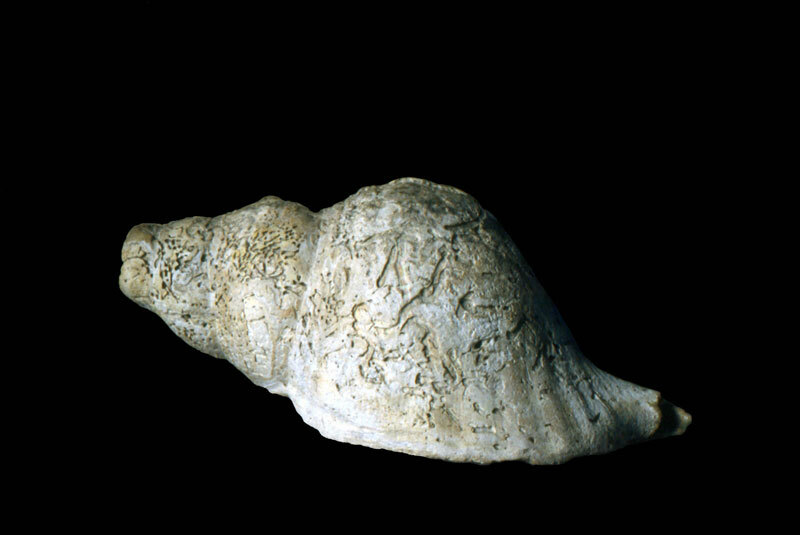 Cristina Majnero (aulos, tibiae, bucina, crotala), Roberto Stanco (aulos, tibiae, lyra, bucina, tympanum), Gaetano Delfini (cornu, bucina, cymbala, tympanum), Daniele Ercoli (tuba, bucina, oblicuum calamum, crotala, tympanum), Mirco Mungari (tympanum, vocal). 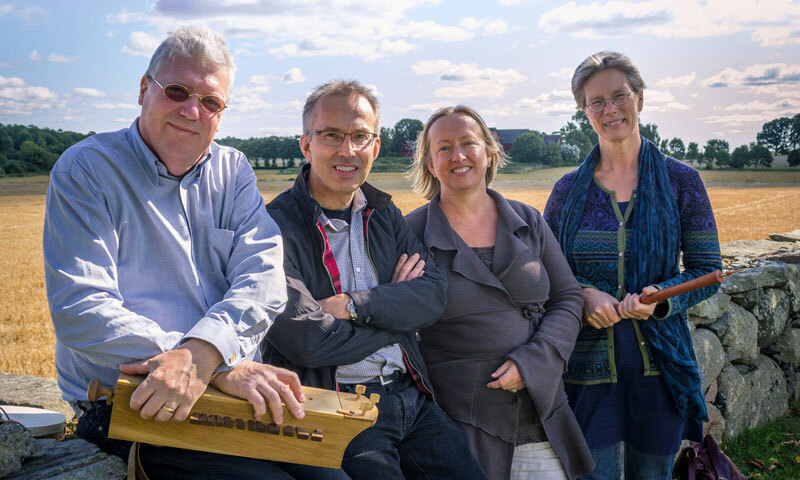 There will be a Seminar and a Concert by the Swedish Music Archaeologists Cajsa S. Lund and the early music Swedish group Ensemble Mare Balticum, around the musical instruments recovered from the Kronan shipwreck and the repertoire of 17th Century Sweden, in an event that shows the fruitful collaboration within EMAP of Musik i Syd and the University of Valladolid. 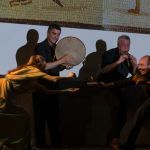 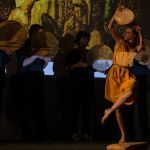 Astounding reproductions of ancient musical instruments and sound tools - from European prehistory until the dawn of Western Music - will be gathered together in Glasgow for the very first time, and played by a large ensemble of music specialists. 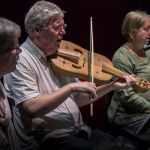 EMAP musicians - groups and soloists coming from across Europe - will lead the audience in a special tour through our common past, dating back up to many thousands of years ago. 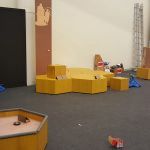 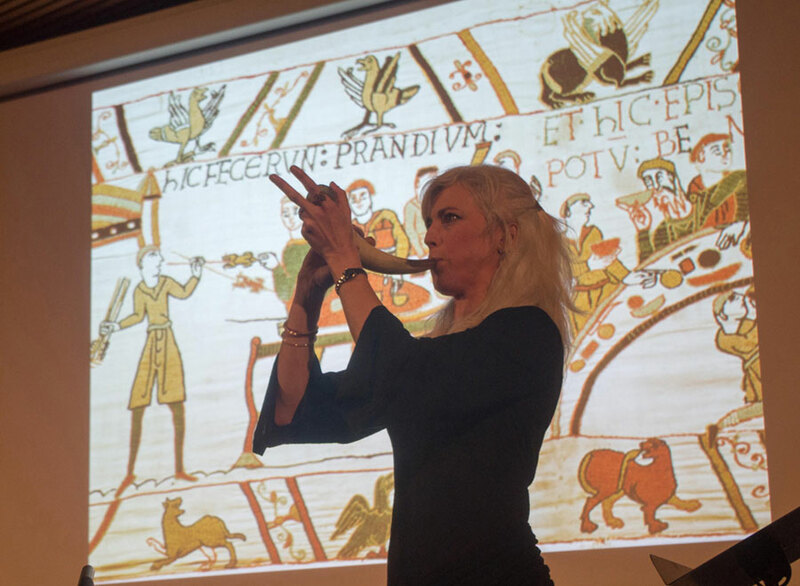 All of the working reproductions that will be played in this amazing event have been carefully modelled on original archaeological finds - dating from Upper Palaeolithic to the end of the Viking Age - hence allowing the listeners to travel in time, on the waves of the actual sounds of our ancestors. 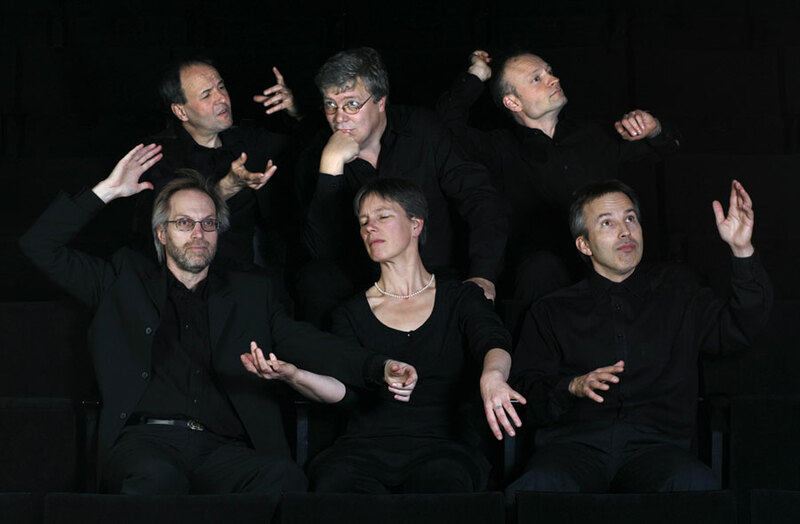 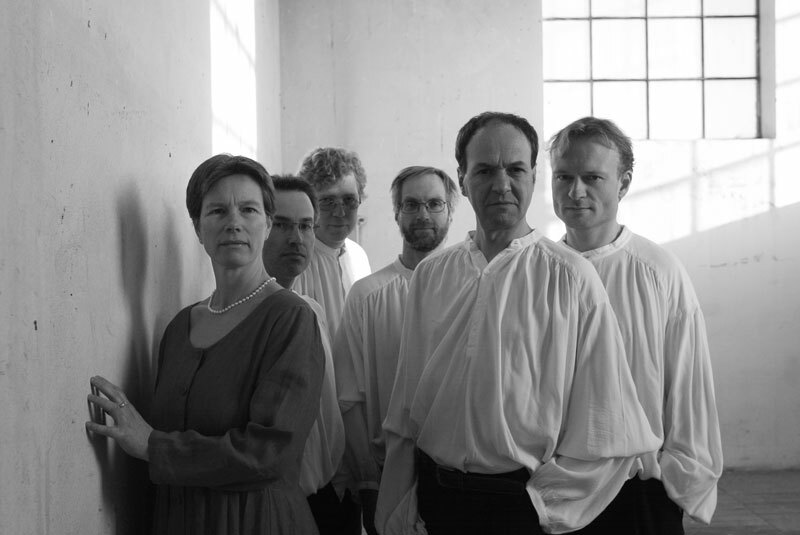 From left to right: Ensemble Mare Balticum, Miriam Andersén, Roza Poulimenou, Barnaby Brown, Stefan Hagel, Alberto Morelli, John Kenny, Patrick Kenny, Ludi Scænici, Tangatamanu. 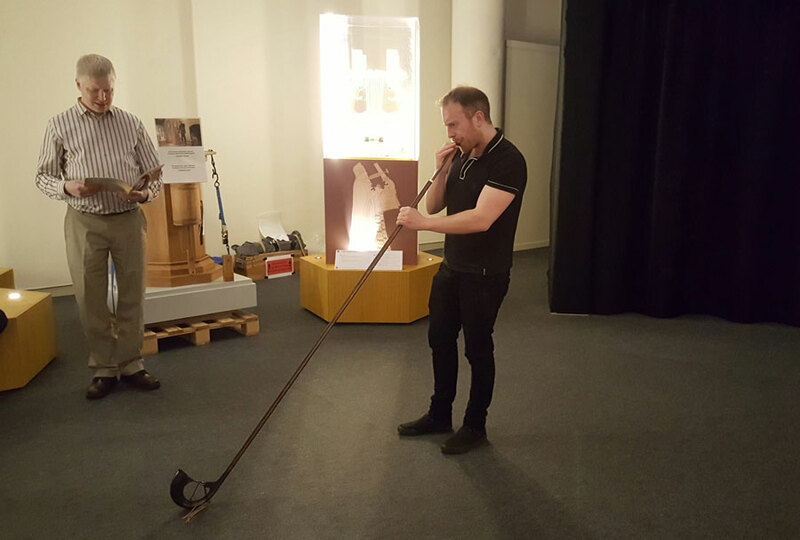 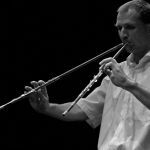 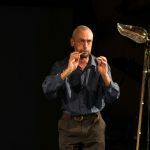 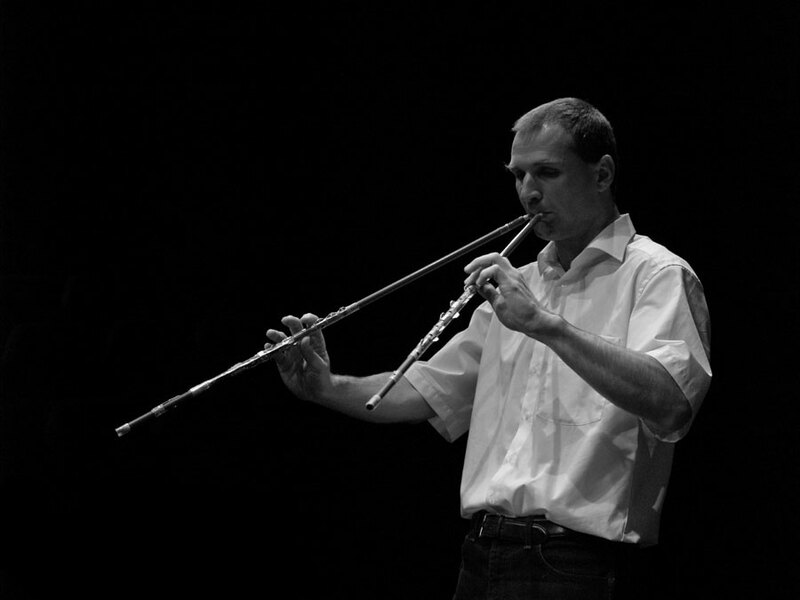 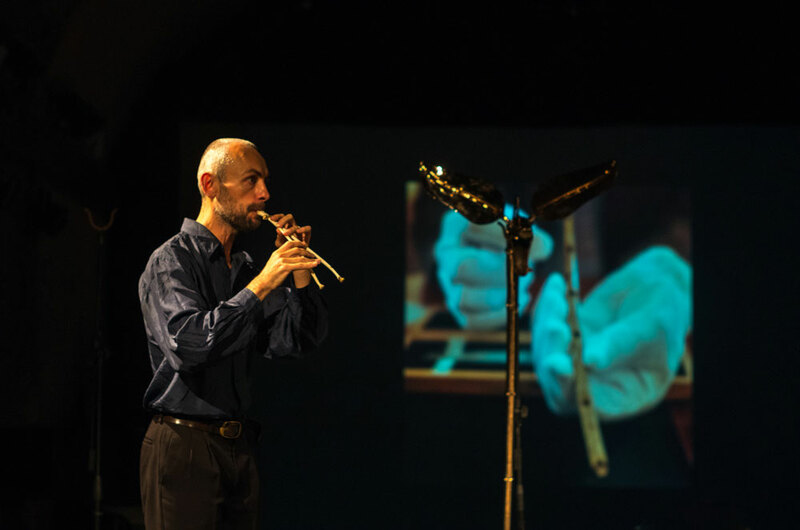 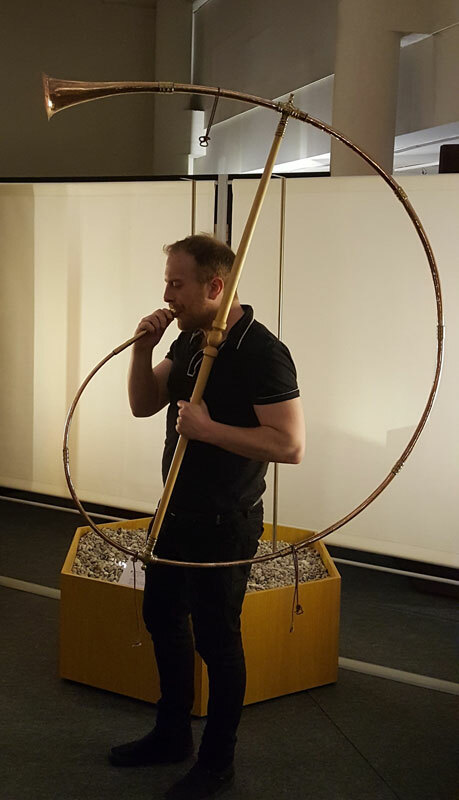 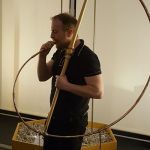 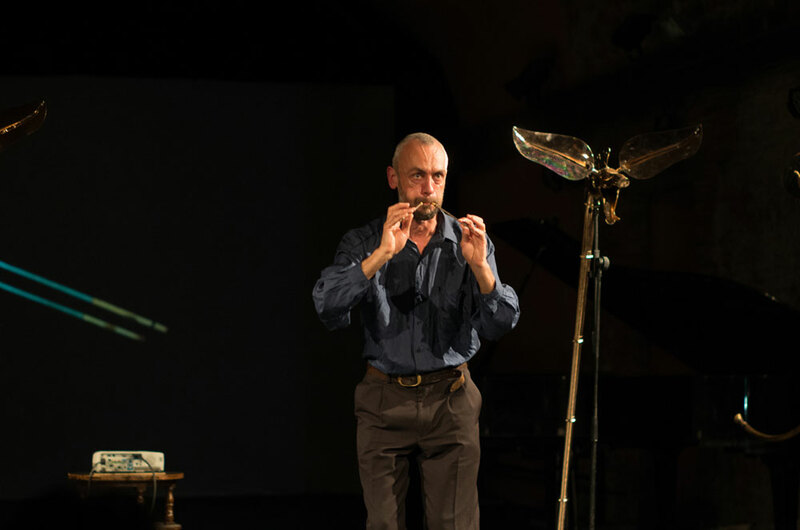 Leading Scottish music archaeology performer John Kenny, plays music which illustrates the early development of wind instruments. 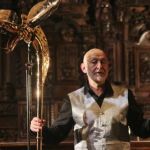 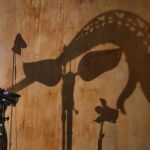 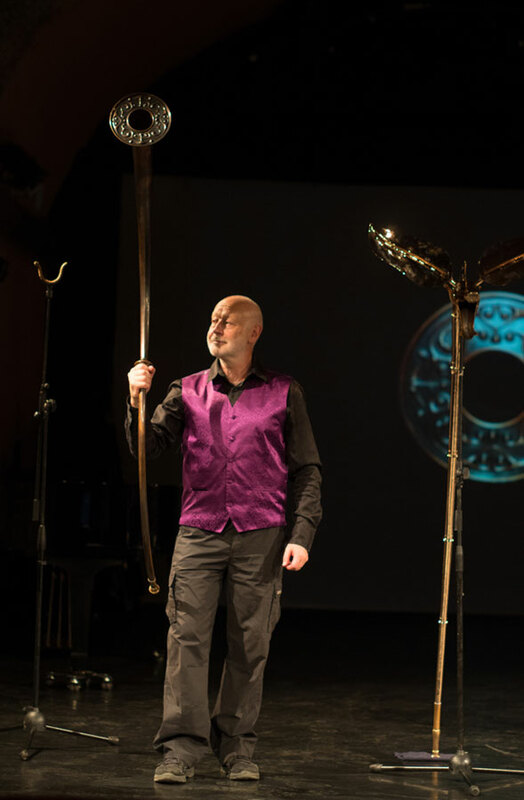 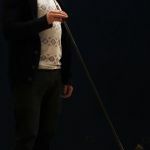 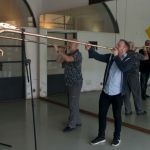 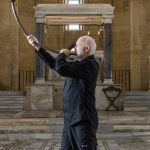 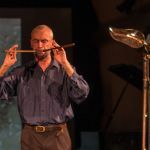 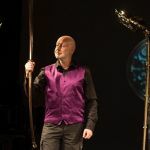 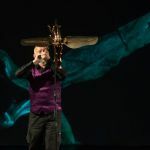 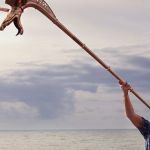 He will perform on a reconstructed model of the 2,000 year-old Tintignac Carnyx as well as two others from Deskford, along with a number of other ancient horns and a reconstruction of the Loughnashade Horn, an Iron Age instrument from Ireland. 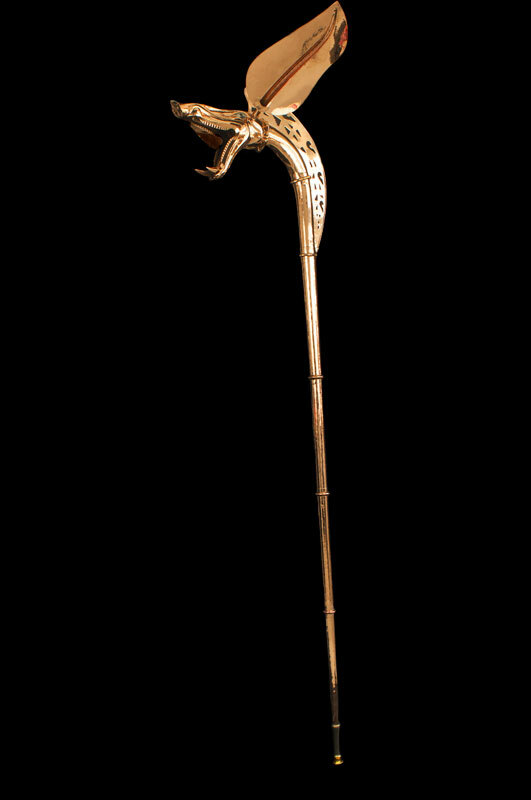 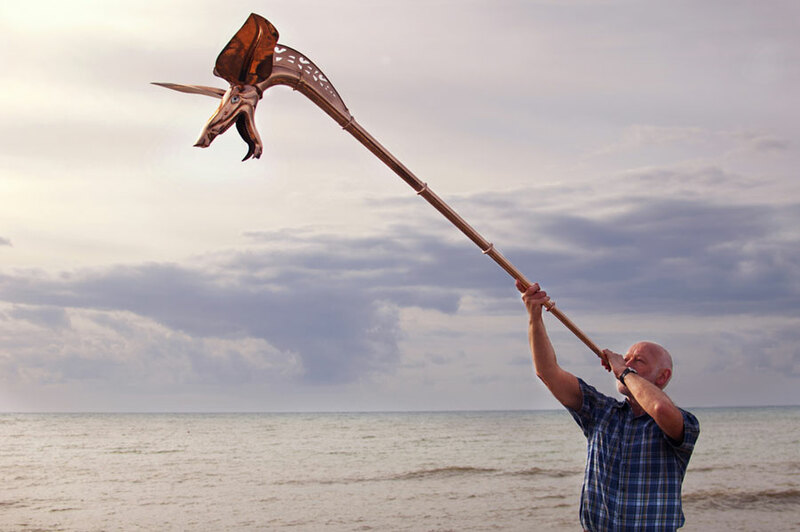 The Carnyx is an instrument found in a range of countries from 200BC to 200AD. 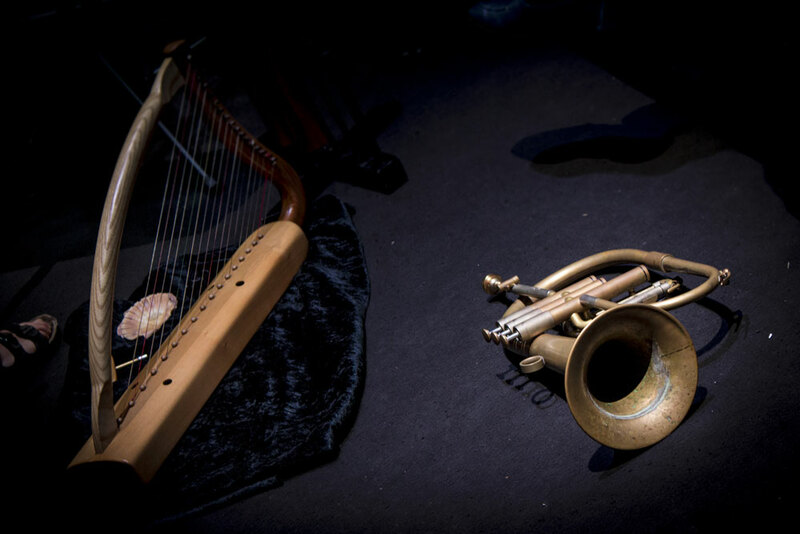 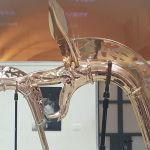 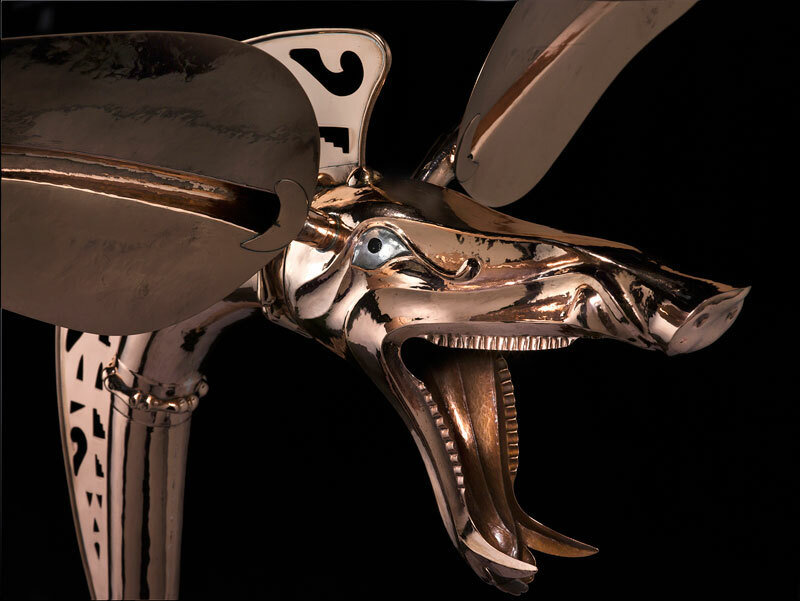 EMAP has reconstructed a model of the Tintignac Carnyx, and it is suggested that this model, as well as two others from Desford, will be performed together in the concert, along with a number of other ancient horns, illustrating the early development of wind instruments. 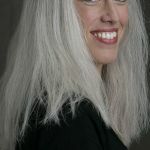 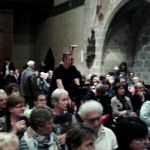 The concert will feature a Question and Answer session, where audience members can find out much more about this fascinating subject. 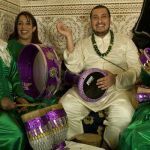 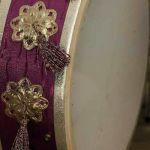 The music played by the female groups or malmaates accompanied by frame drums and clay drums is one of the most interesting patrimonies of the city of Meknes. 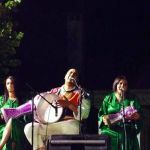 The songs praising the saint spirit of Lala Malika are played by this professional groups in different festive occasions, specially for the accompaniment of female Trance. 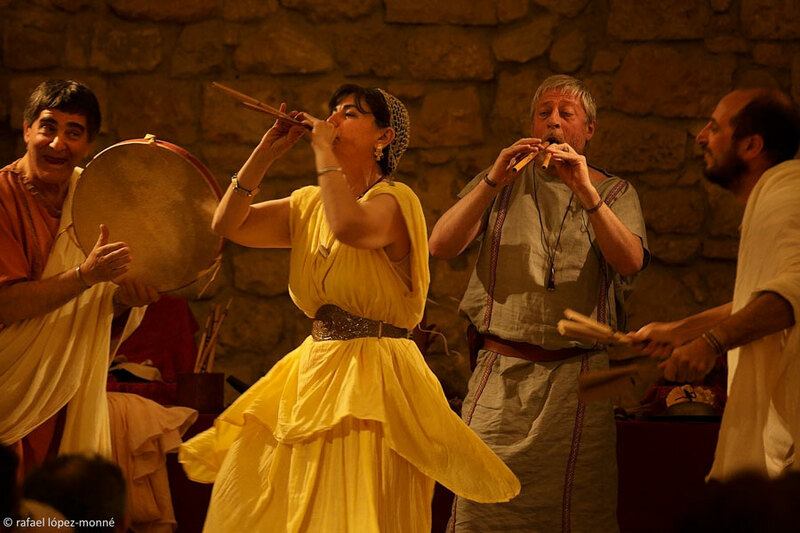 The evidence of Trance feminine and effeminate rituals goes back to the antiquity, and for the Islamic world is attested since the Middle Ages. 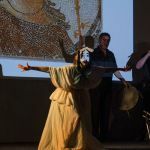 Archaeological, iconographical and written sources suggest that this professional females groups playing in popular rituals were common in al-Andalus and disappeared with the Christianization of the territory. 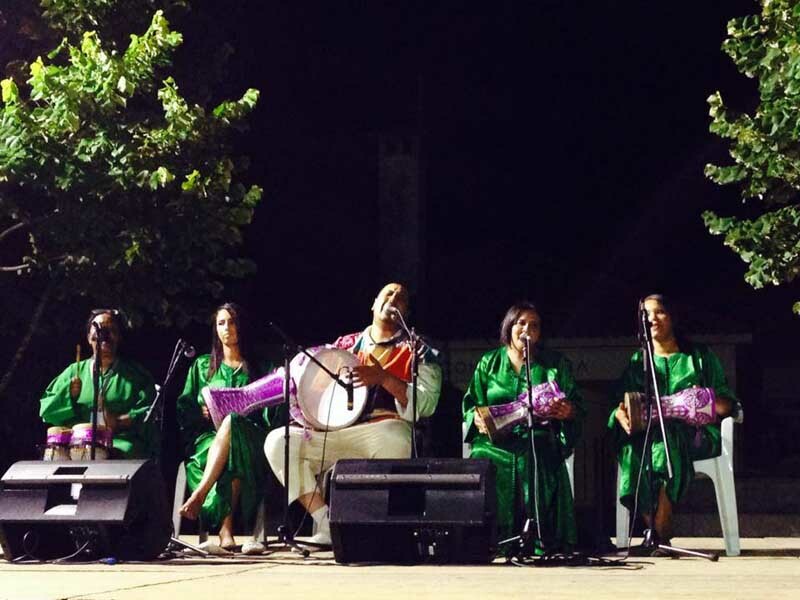 Meanwhile, only 12 km across the strait of Gibraltar, this feminine music is more alive than ever. 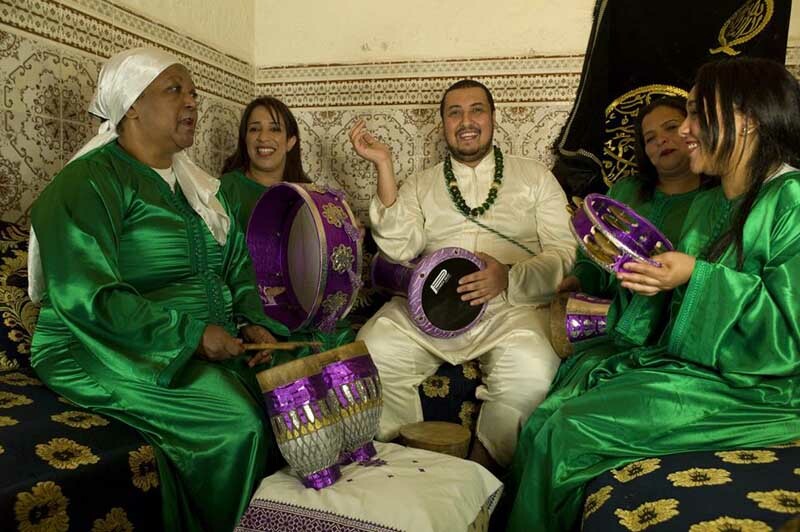 Music from the female trance rituals of Meknes. 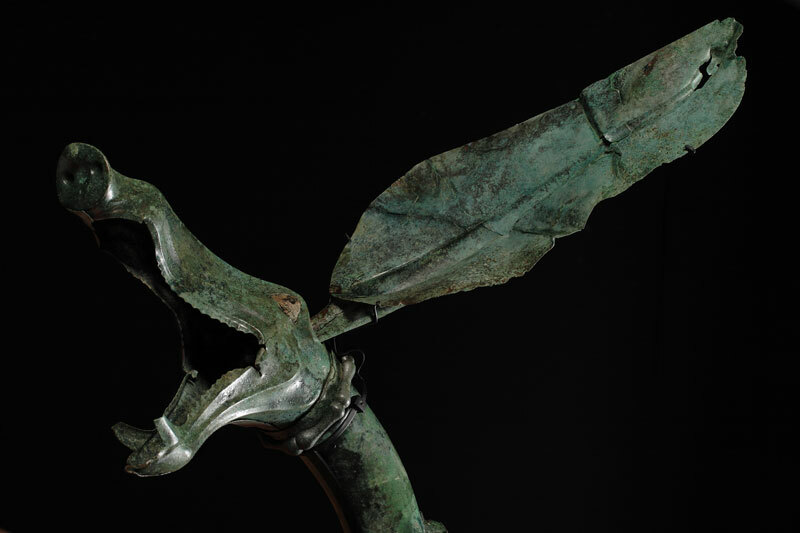 The magnificent Tintignac Carnyx has remained silent for 2,000 years. 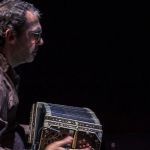 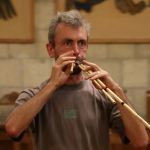 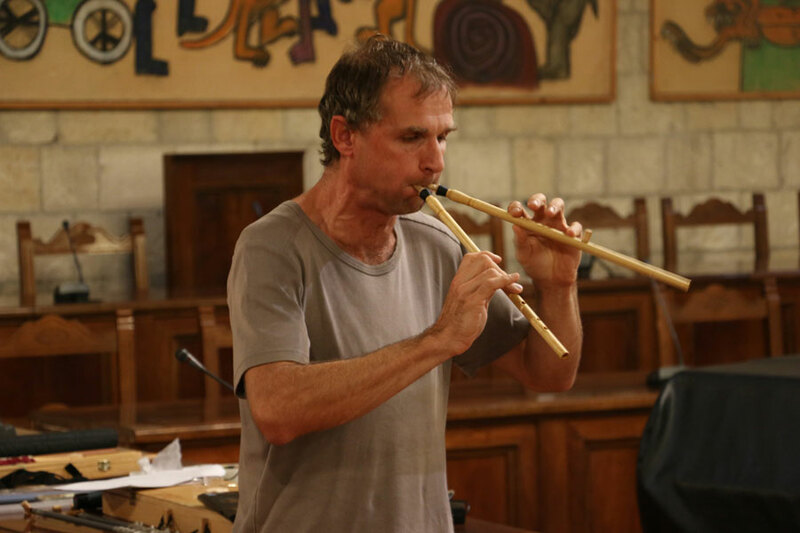 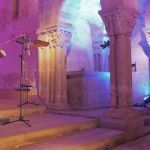 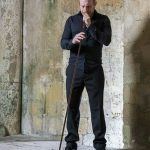 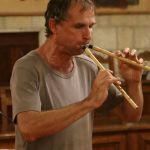 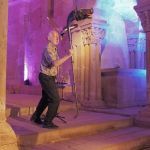 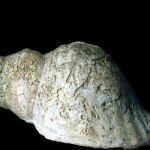 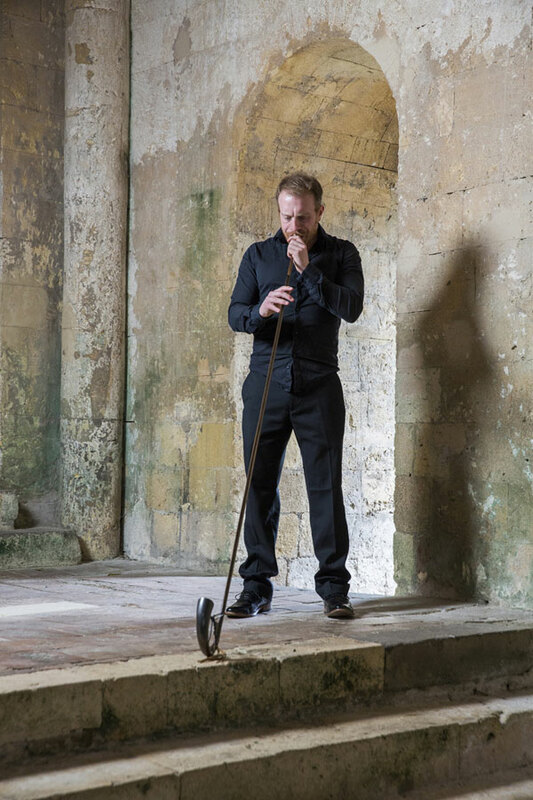 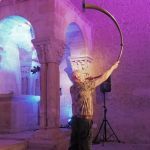 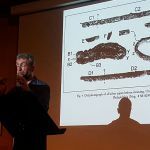 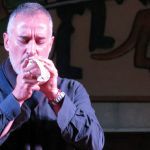 The exceptional concert of John Kenny in Naves - the town where fragments of 7 carnyces were discovered ten years ago by the archaeologist Christophe Maniquet, in the Gallic and Gallo-roman site of Tintignac – has been a unique opportunity for a dive into the sound of the past. 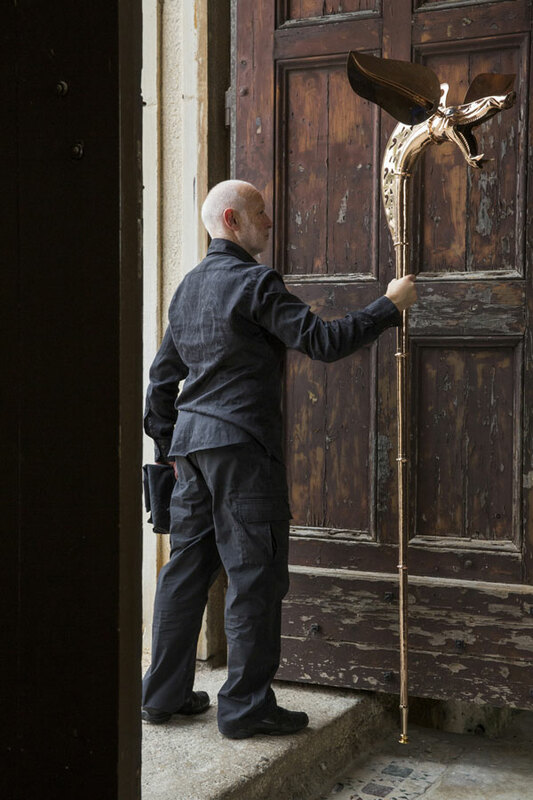 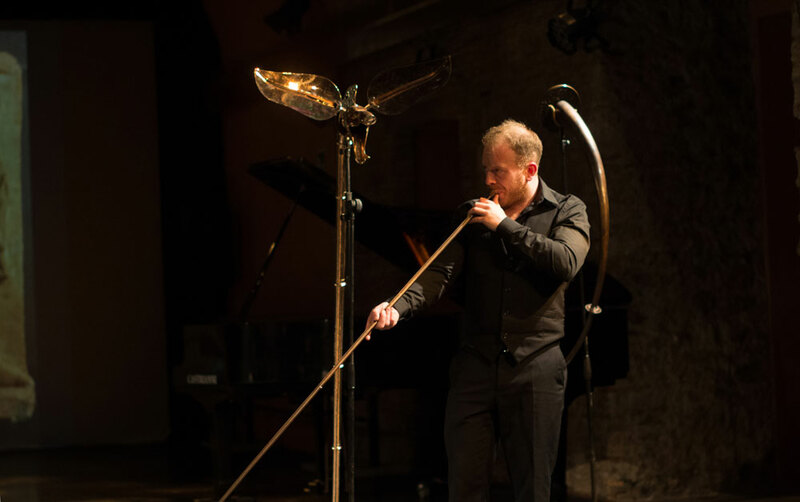 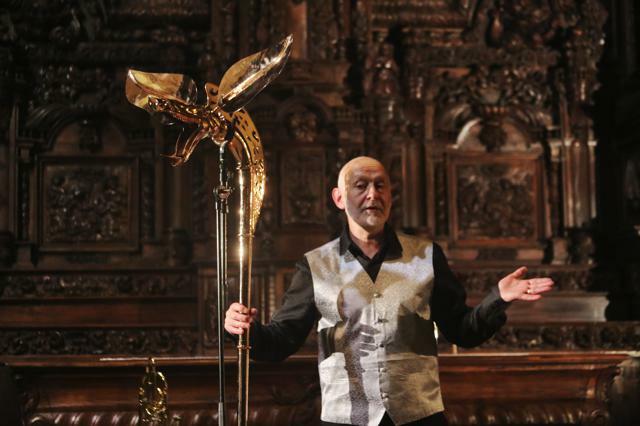 As a member of EMAP, John Kenny will perform all around Europe with this wonderful carnyx – newly reconstructed by Jean Boisserie – and an exciting preview of his performance took place in the 14th century church of Naves, with its outstanding Baroque altarpiece as the imposing background. 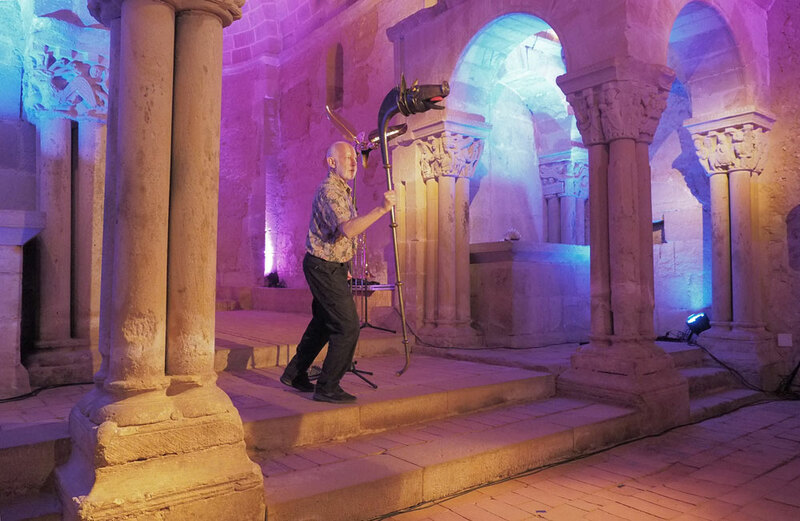 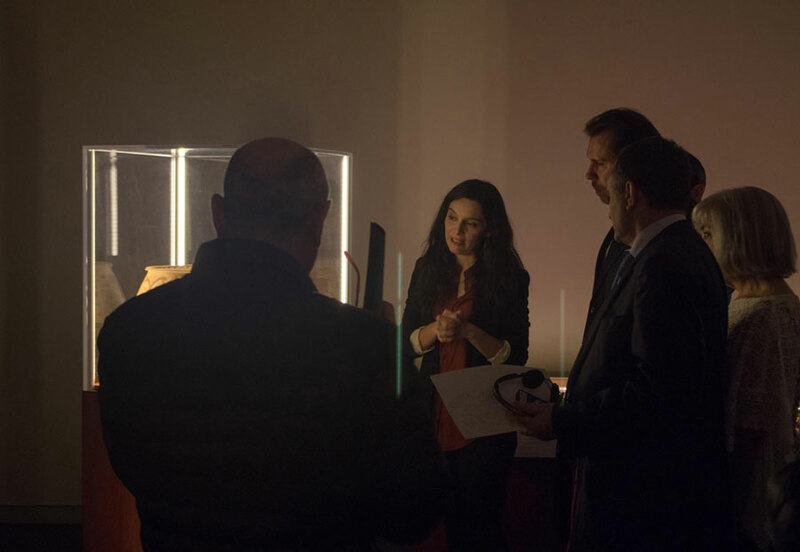 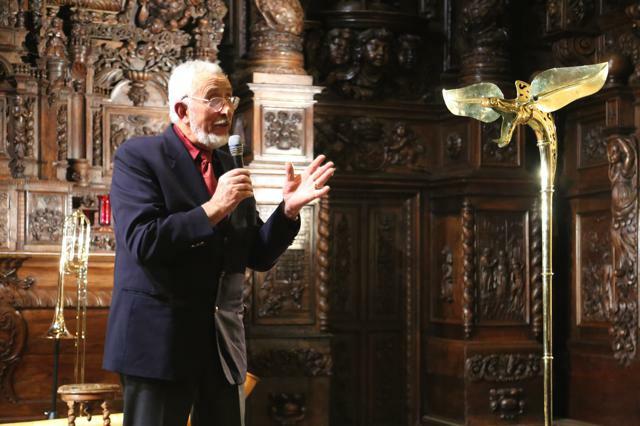 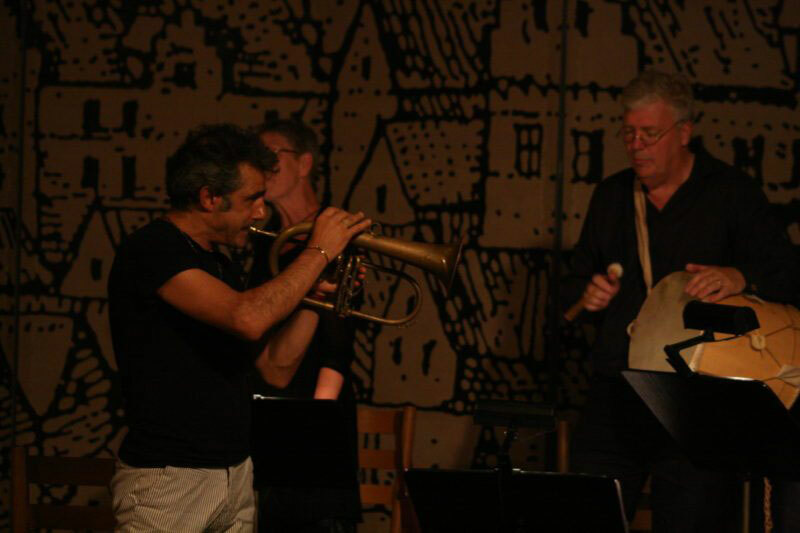 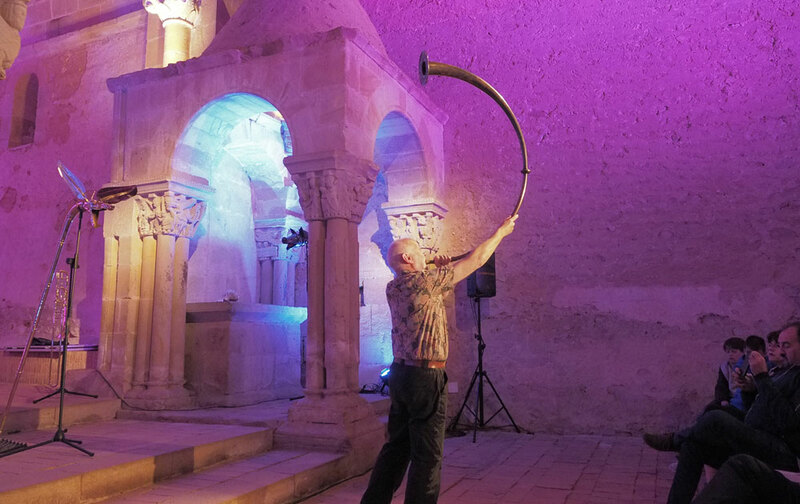 The Tintignac Association, which is working for the cultural development of the local archaeological heritage, organised this event and the audience listened to the voice of this wonderful bronze trumpet for the first time since the Gallic period. 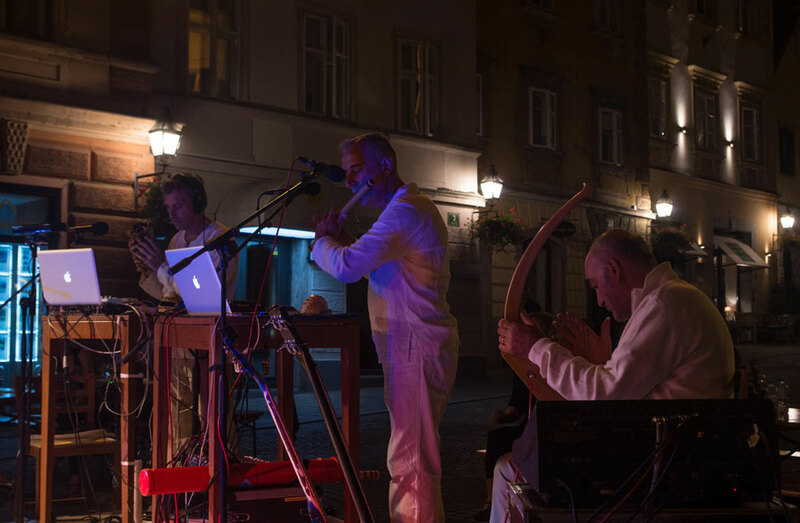 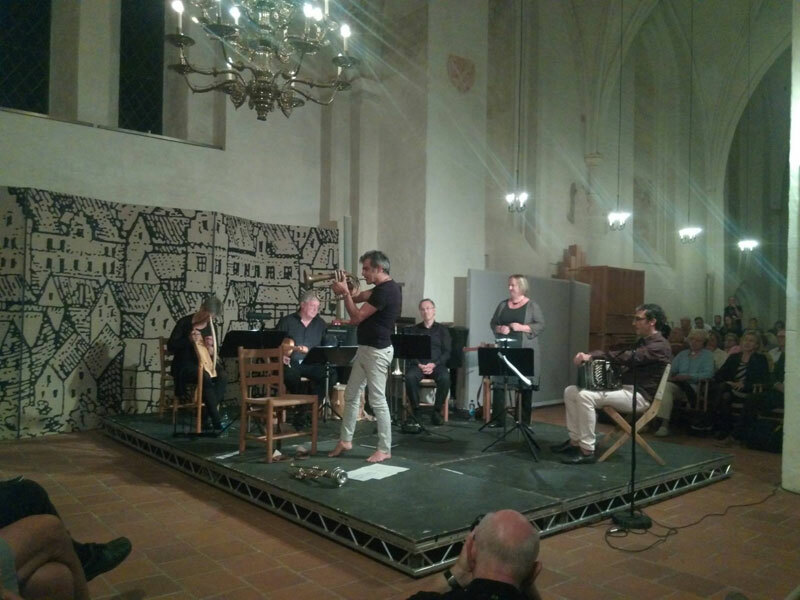 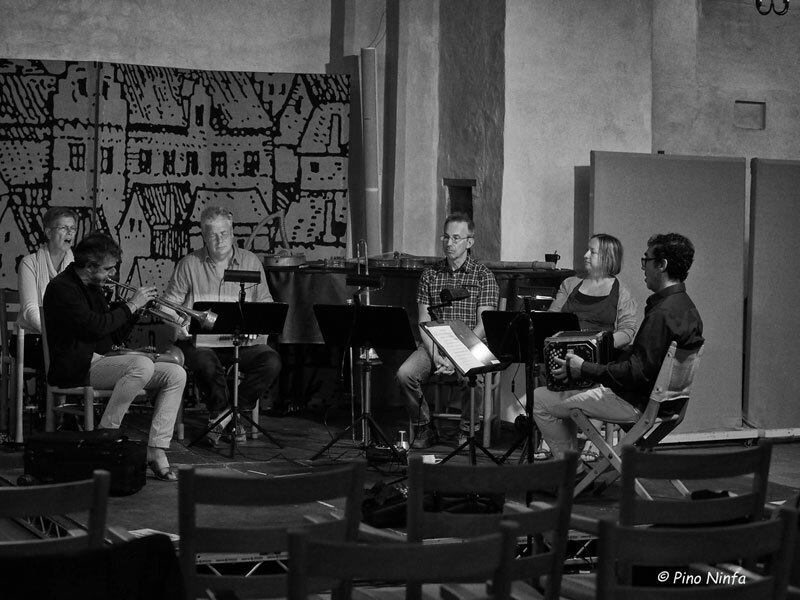 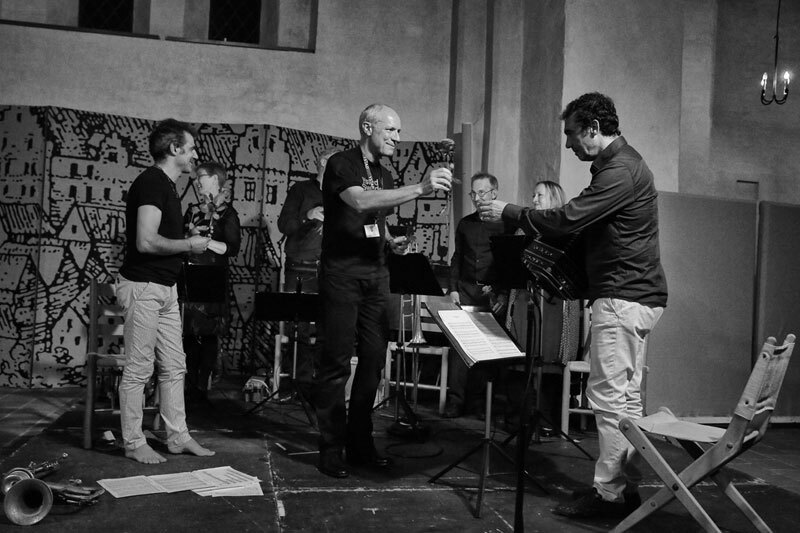 The European Music Archaeology Project participated in the Festival with a team of scholars (Cajsa Lund, Emiliano Li Castro, Stefan Hagel) and musicians (Åke Egevad, Ensemble Mare Balticum, Peter Holmes, Barnaby Brown, John Kenny, Ludi Scænici). 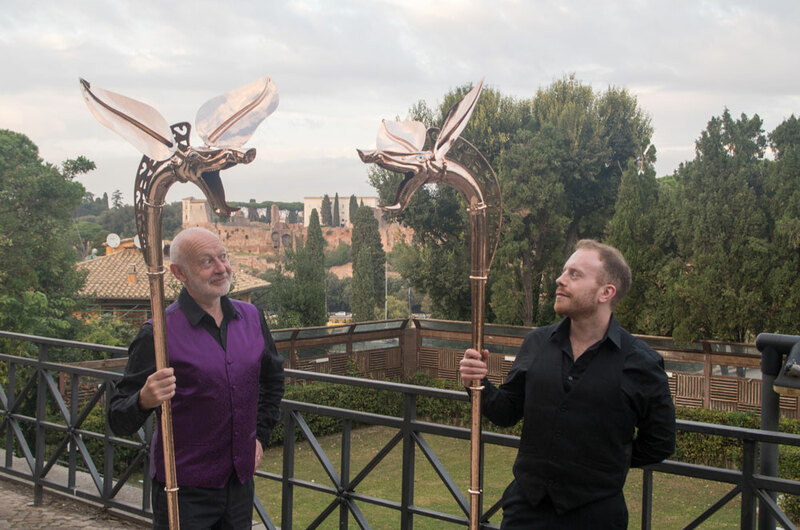 Have you ever heard a tibia, or a carnyx or a lyre? 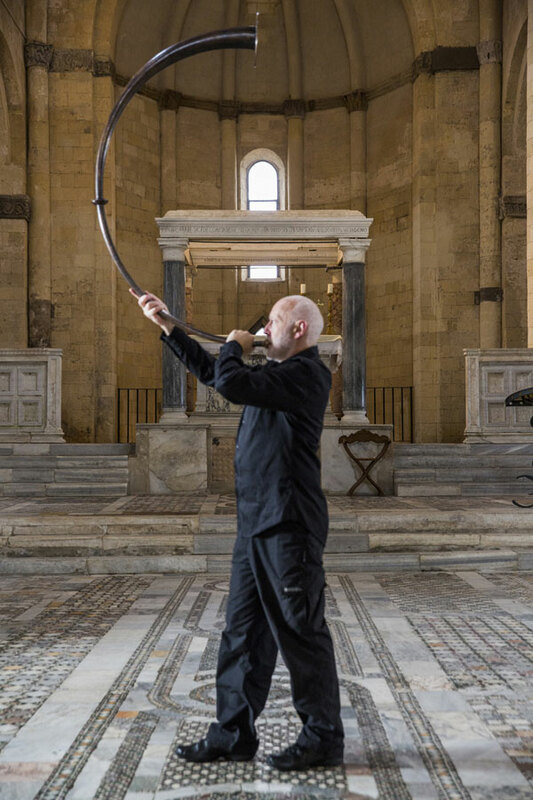 Wondered what Nero fiddled as Rome burned or what Larry Loinsigh’s harp sounded like? 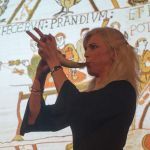 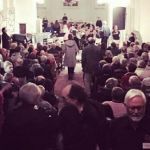 This year’s festival presented a series of concerts, lectures and workshops which provided a fascinating glimpse into the early musical culture of Europe, following the development of European music from ancient to early medieval and renaissance in a programme guaranteed to delight and astonish the audience. 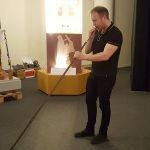 It was a unique opportunity to see and hear all sorts of early horns such as the bronze-age Irish horns, the amazing animal headed carnyx, and Roman cornua, tubae and bucinae as well as lyres, tibiae, early Irish harp, triple pipes and all sorts of rattles, percussion and many other early sound tools. 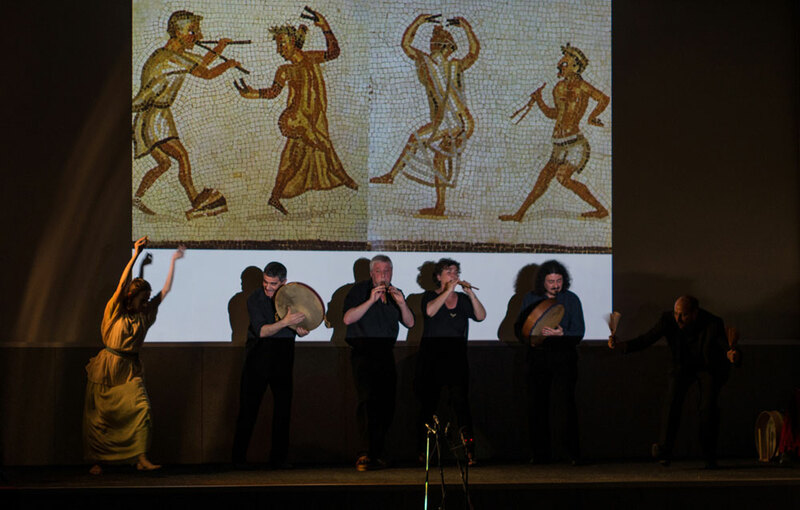 Watch the video "AD/BC: An Archaeomusicological Adventure 2014"
Watch the video "2014 Galway Early Music Festival Highlights"